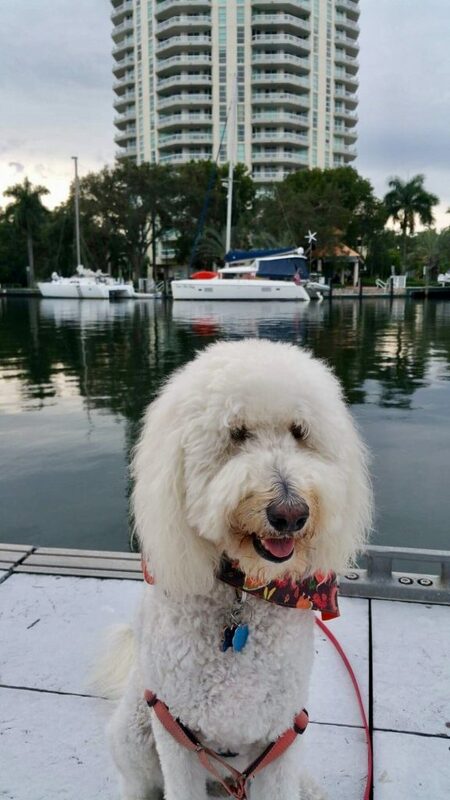 We left Lake Worth at 0645 on Tuesday, November 21, 2018, and arrived at Slip 4 on the New River Docks in Ft. Lauderdale at 1340. We arrived at 1240 at the 17th St. Causeway Bridge just around the corner from the inlet and went under the bridge at the next opening at 1300. It took us forty minutes to get to the New River Docks and tie up at along the sea wall just before the 7th Ave. bridge. We had to request two bridge openings on the New River and luckily got under the railroad single bascule bridge five minutes before it closed for a train. We went a total of 51.86 miles in six hours and 56 minutes, staying about a mile offshore with small swells on the port aft side of the boat. 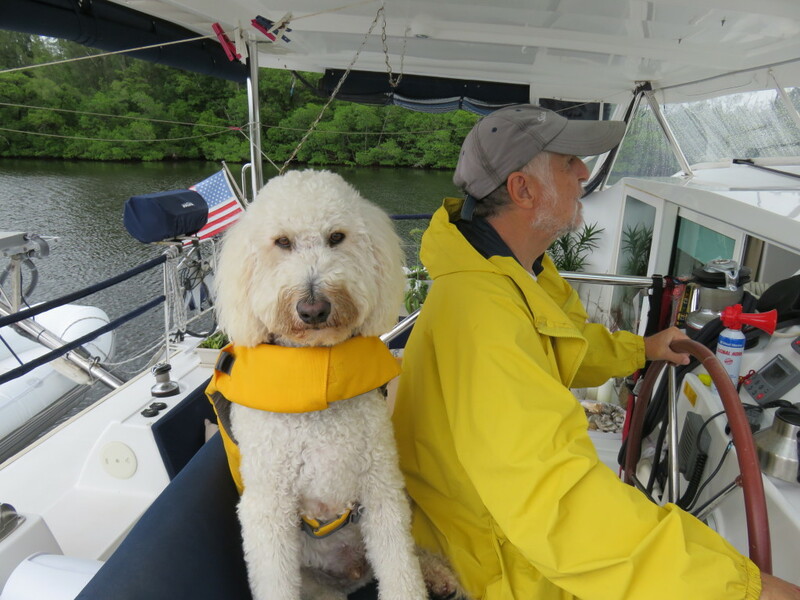 It was comfortable enough that after exiting the Lake Worth Inlet and motorsailing for awhile, Sailor was convinced it was “safe” for him to go outside and sleep under the helm seat. We have gone up and down the New River many times, every season except last year, since 2008. 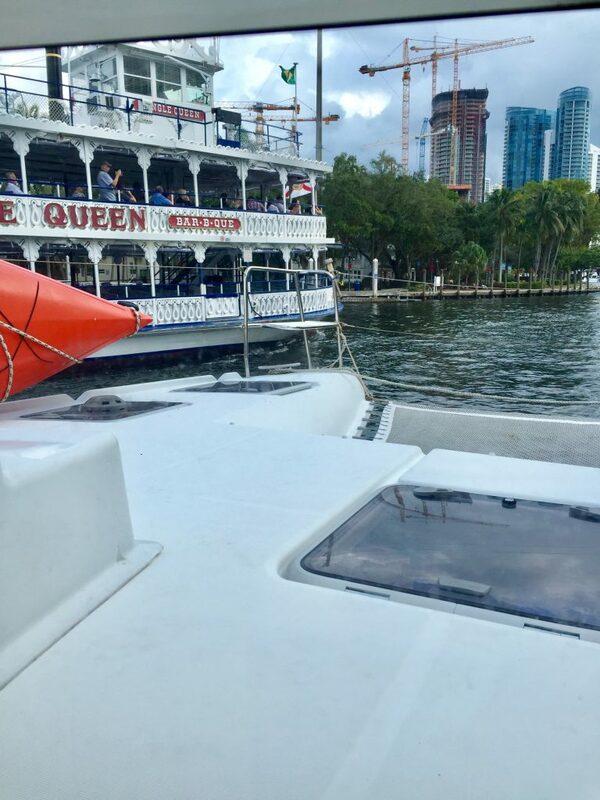 The river is not very wide and there are numerous megayachts, sailboats, powerboats, fishing boats, tour boats, water taxis, pontoon boats, seadoos, kayaks, floating tiki bars, gondolas and small pleasure boats on the river. We have never had a problem, but this time on our way to our slip Mark moved over for a tour boat to pass us going the other direction and we went aground! The New River is dredged to the sea walls on either side, but unfortunately we found an area where the depth was less than five feet deep. Mark quickly backed out and we probably had no damage, but it was a shock after an uneventful trip here. 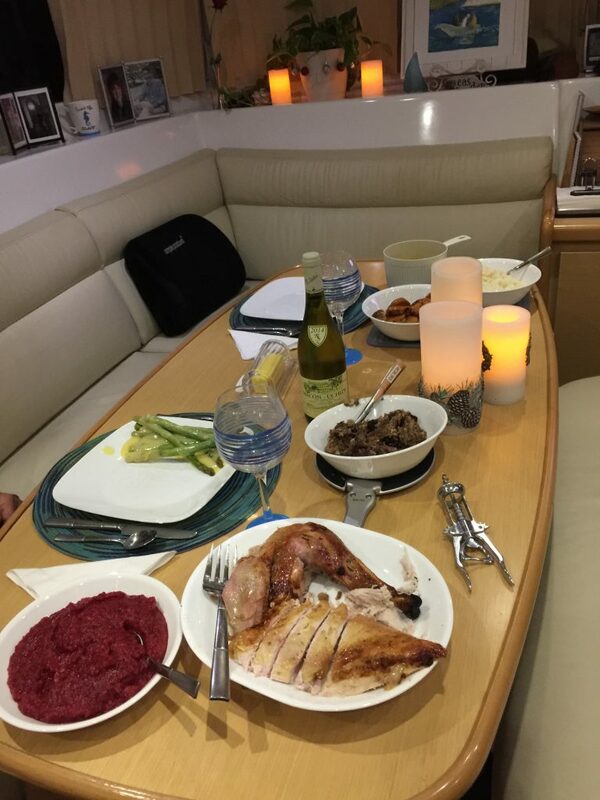 We are staying in a slip on the New River until Sunday, partly due to weather on the ocean for our sail to Miami, partly because we have a few boat repairs, partly so we could cook a Thanksgiving meal using various appliances, and mainly to rest and enjoy our last unlimited power and water at a dock until we return to Sunset Bay in May. 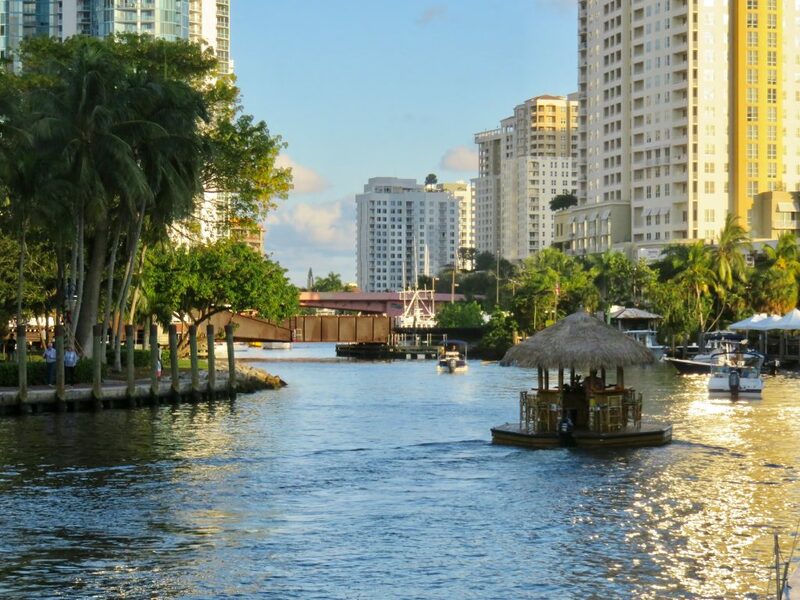 We are located right across the river from the Broward Performing Arts Center. Several years ago we were here in December and saw “The Nutcracker.” Right now, “The King and I” is showing and the next production is “Legally Blonde.” The buildings are beautifully lit up at night and will probably be adding more decorations for the Christmas holiday. To the left of the Performing Arts Center in the photo below is the Huizenga Pavillion. Wayne Huizenga Sr was a well known businessman, entrepreneur and the founder of Blockbuster Video, Waste Management , AutoNation and owner of a number of sports teams. The family is well known throughout Florida for their philanthropy. His daughter and son-in-law are owners of our home marina, Sunset Bay. The pavillion is used for events and dining before attending the theater productions. The photo was taken from our boat. Before we left Stuart, we purchased all the “fixings” for a Thanksgiving meal. Mark cooked the 14 pound turkey in our Magma Grill. 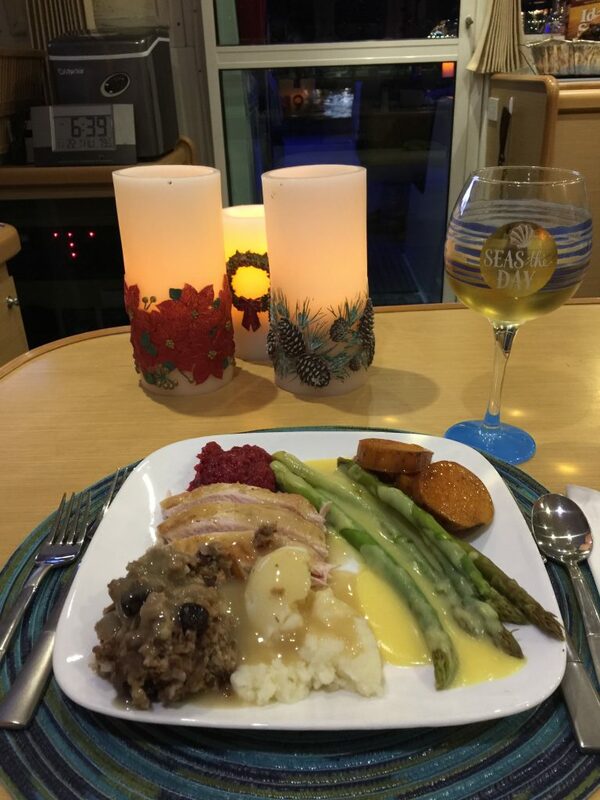 In addition he made all the side dishes: mashed potatoes, sweet potatoes, steamed asparagus w/hollandaise sauce, homemade cranberry/orange relish, stuffing and gravy. 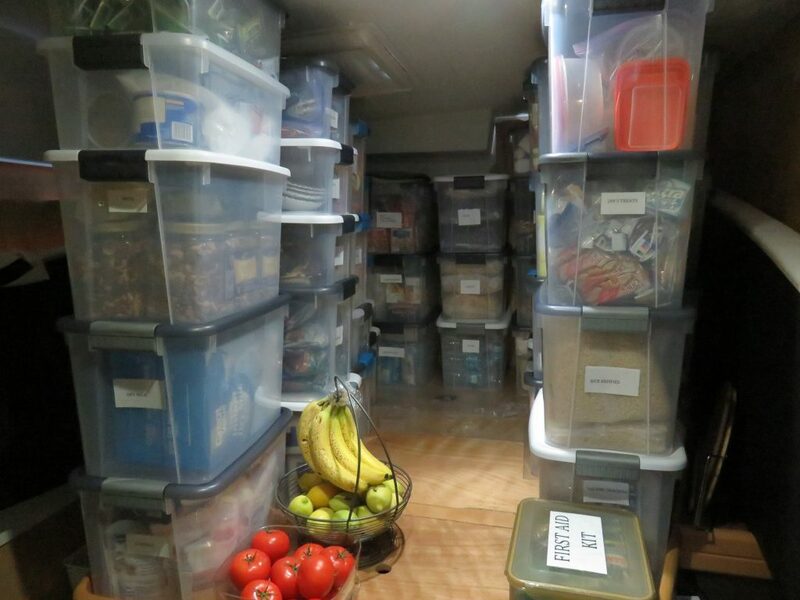 We have lots of leftovers in our refrigerator and freezer. My job was to clean up after the meal. Naturally we don’t have a dishwasher, but even after meals this huge, I don’t miss it. 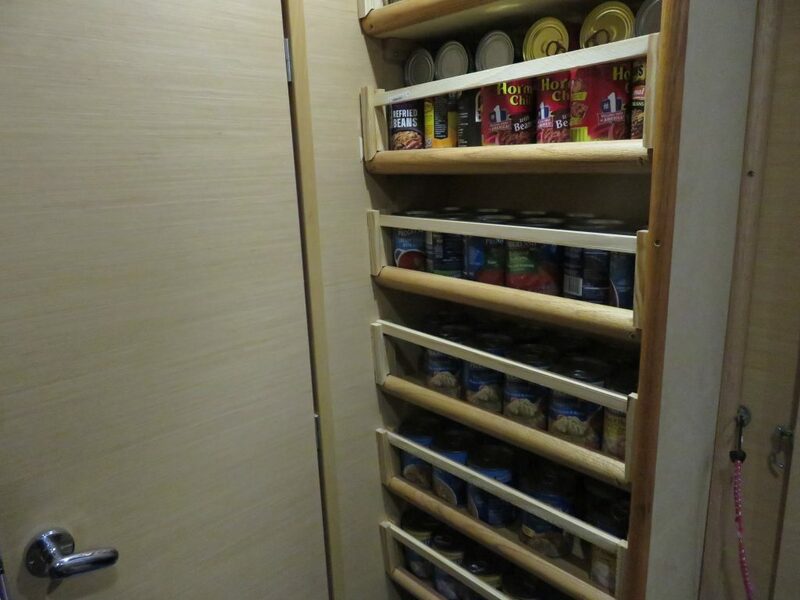 However, it would be nice to have an empty cabinet to hide dirty dishes in until they can be washed. 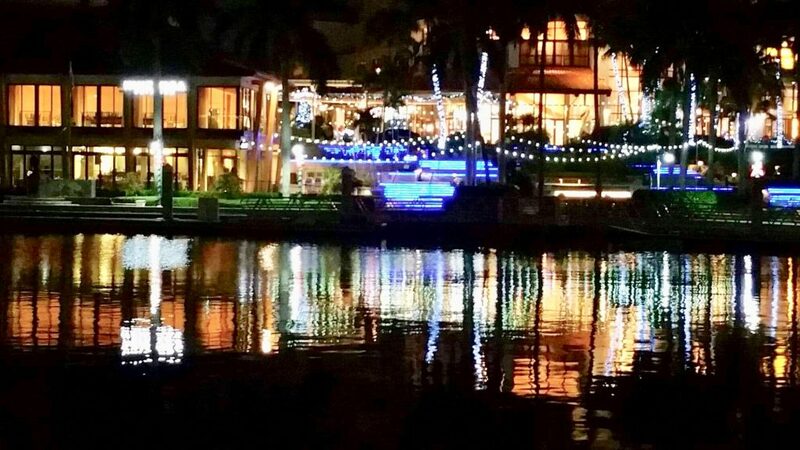 You can see the Broward Performing Arts Center lit up across the river through our galley window. We are in a slip next to a small park and the paved Riverwalk runs past us. 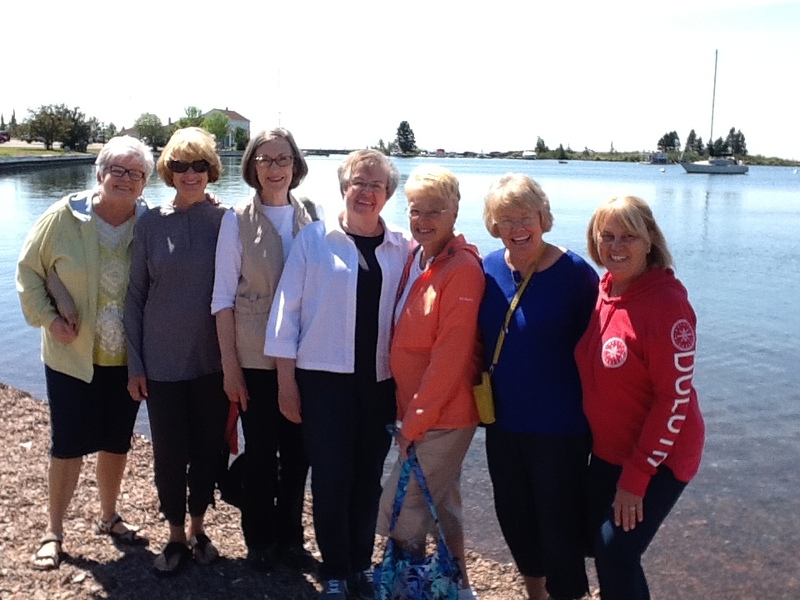 We are also in the widest part of the river at a turning basin, where boats have room to turn around. 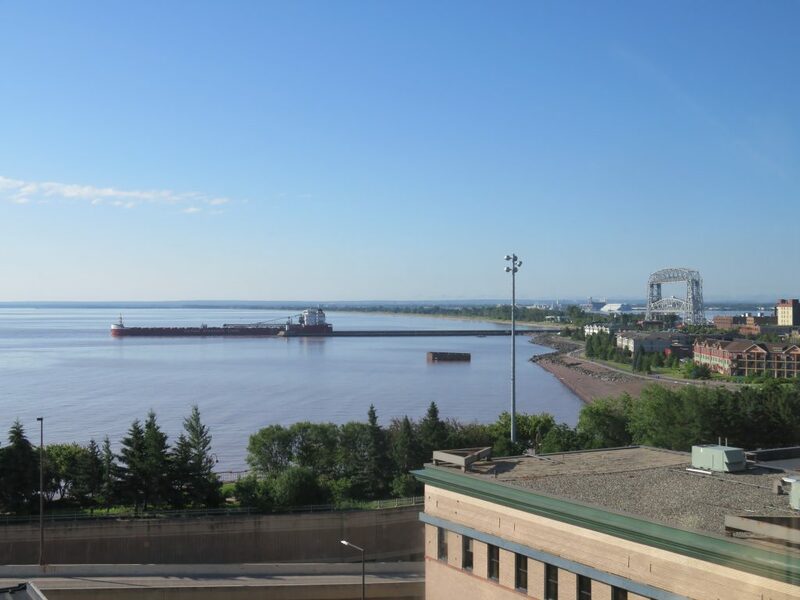 There is a lot of boat traffic, but the whole river in this area is a no wake zone so most boats go by very slowly and rarely make our boat rock. Sadly, there doesn’t seem to be a noise ordinance and some small craft have speakers spewing loud music at all hours of day and night. The bridge tender near us must have gotten fed up last night because we heard him yell over his loudspeaker to a passing boat to turn the music down or he was calling the police. The music abruptly stopped. 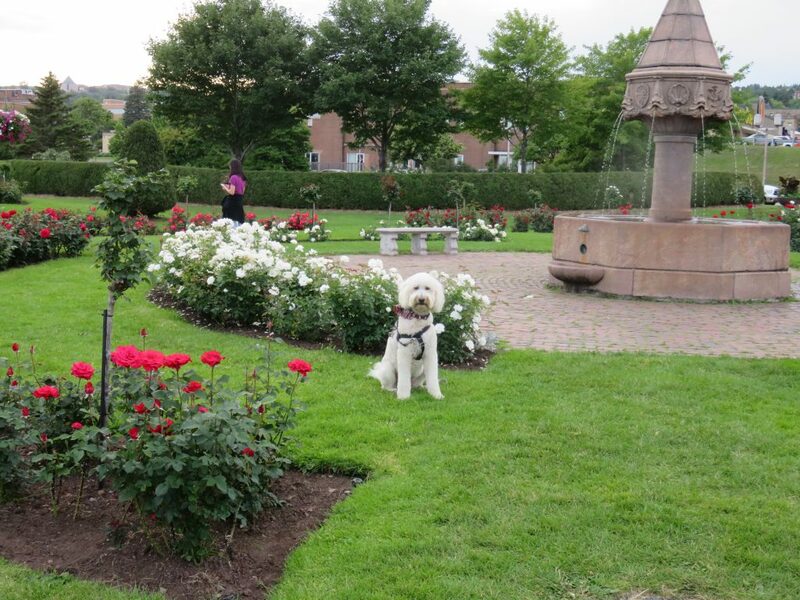 Below are a few photos of the area around us. There are lots of high rise condo and apartment buildings on this part of the river. Farther to the east, toward the ocean, the river edges are bordered with huge mansions. The little park area below is a few steps from our boat. 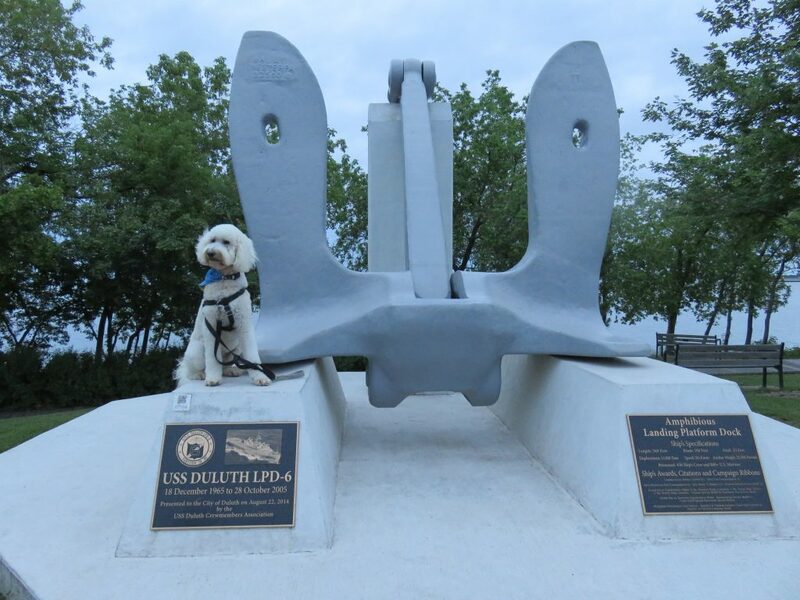 It makes walking Sailor very easy, although I suspect he prefers riding in a dinghy to the beaches. Thanksgiving Day was rather quiet on the river, but the day after everyone who has a small boat must have been out, along with a few large yachts that have been farther up the river at the Lauderdale Marine Center having work done. The megayachts are so huge they are required to have tow boats guiding them. 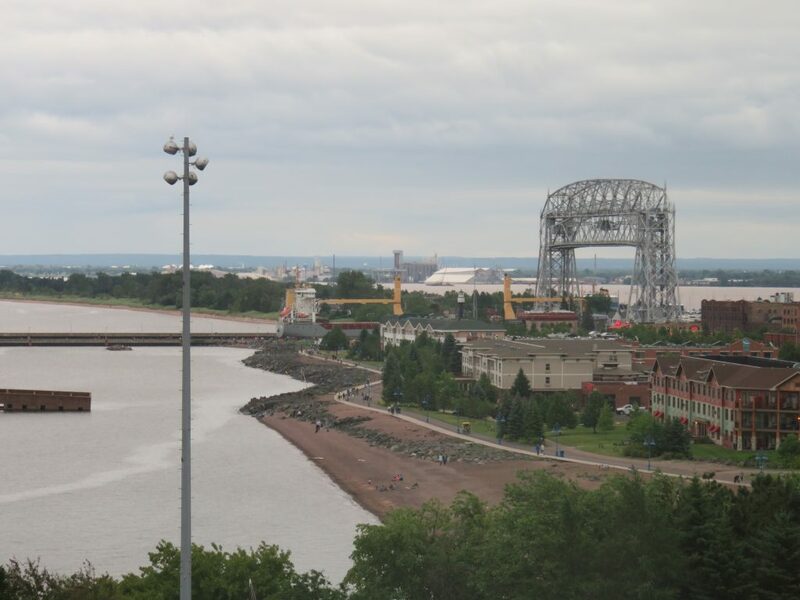 We even saw a tiki bar pass by in the late morning, a little early for drinks, but I’m sure they tell their customers, “It’s 5:00 somewhere.” In this picture you can clearly see the brown railroad bridge down and one of the the pink bascule bridges further on that opens on request. Early Friday morning we woke up to the sound of bow thrusters. 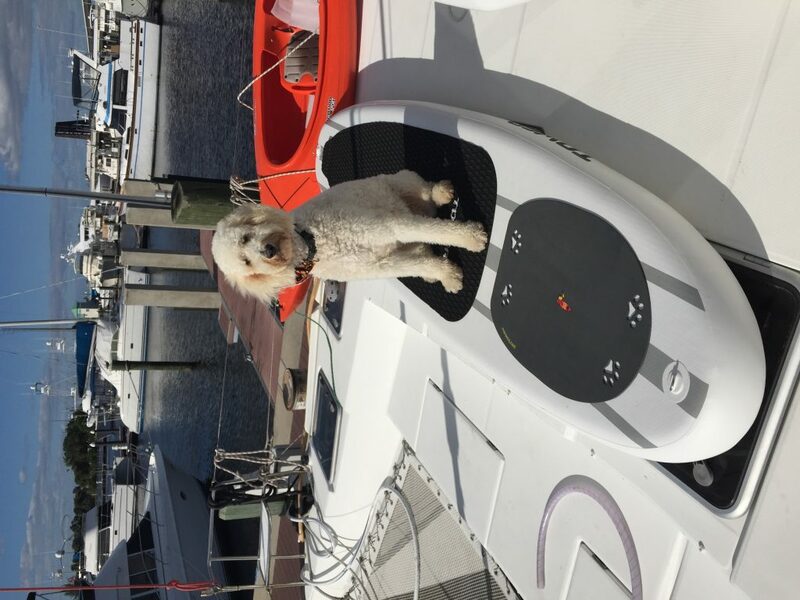 Many powerboats, all yachts and some large sailboats have these devices so they can maneuver sideways into slips or away from a hazard. Yesterday morning our boat was the hazard. 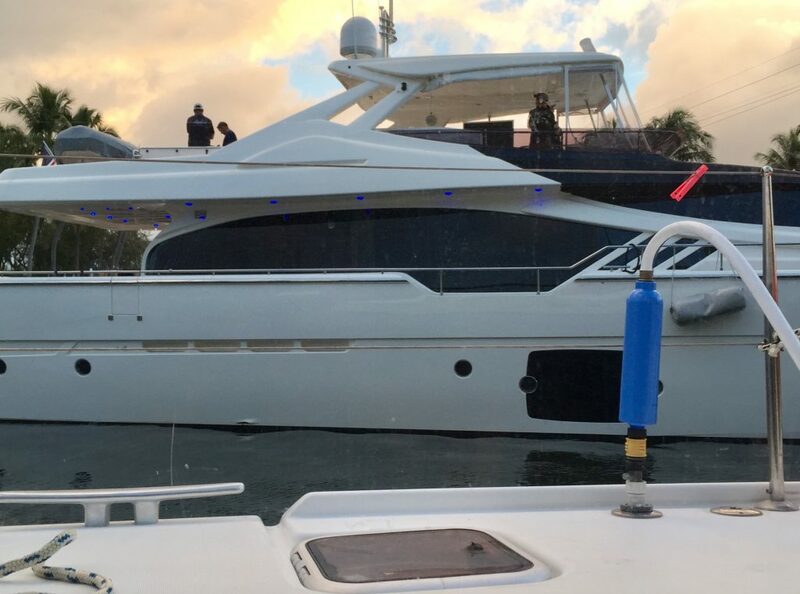 A yacht was held up for almost a half hour waiting for the nearby railroad bridge to go up. 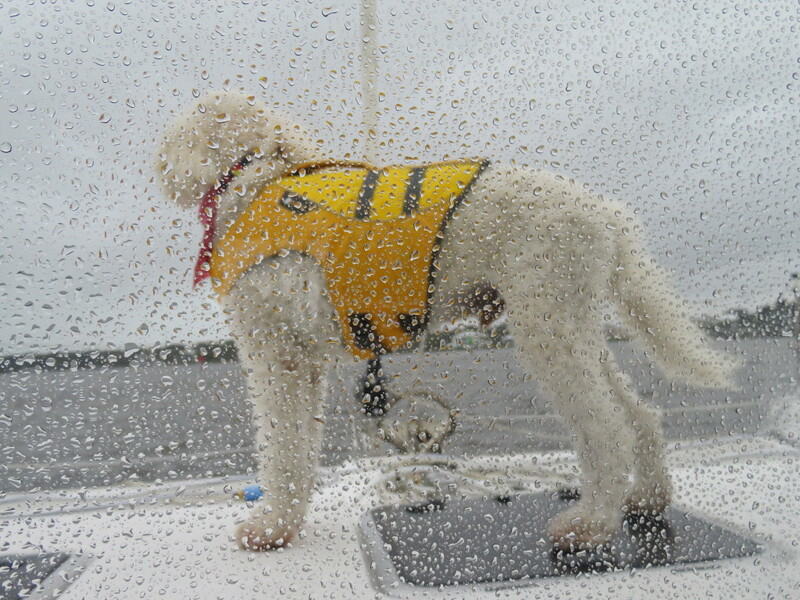 Every 5 to 10 seconds, the captain used the bow thrusters to keep away from our boat as the current was strong. 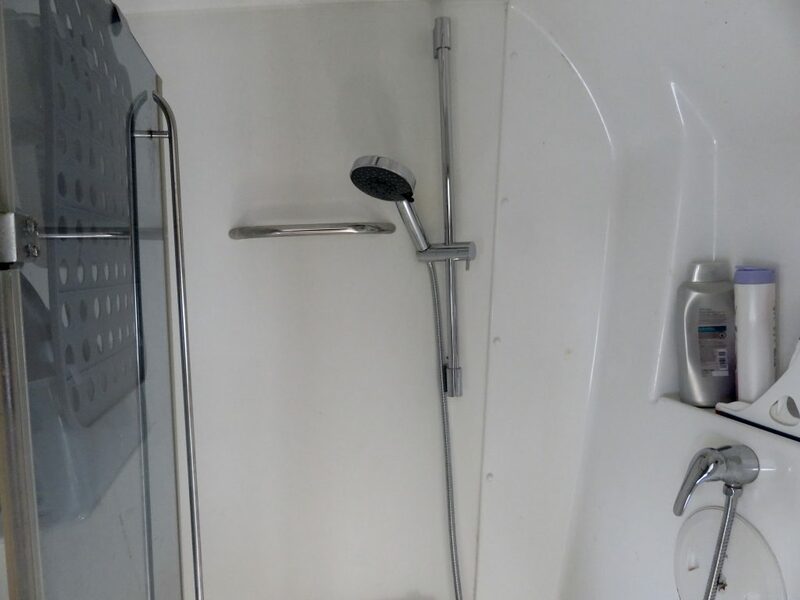 The bow thrusters can be heard through the water and I woke up to them at 6:55 am. I came into the salon, looked out the window and saw this. 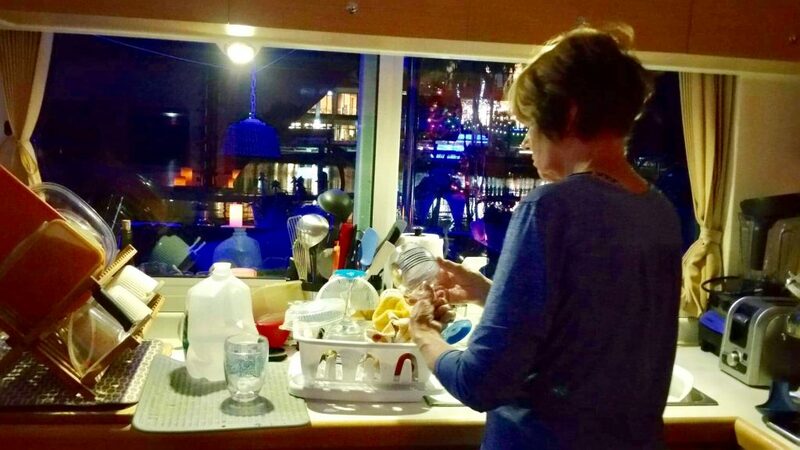 Just after I took this photo through the salon window, in my nightgown, three men on the yacht’s bridge waved at me. Hopefully they thought that was a dress I was wearing. We don’t worry about any of the large yachts hitting us, since they have very experienced crew. The entire half hour they were next to us, two crew members were standing on her starboard side watching that she didn’t get too close to us. Several more crew members were on the bridge and the captain was using the thrusters as needed. We always watch out for The Jungle Queen, a large tour boat that goes up and down the river constantly. 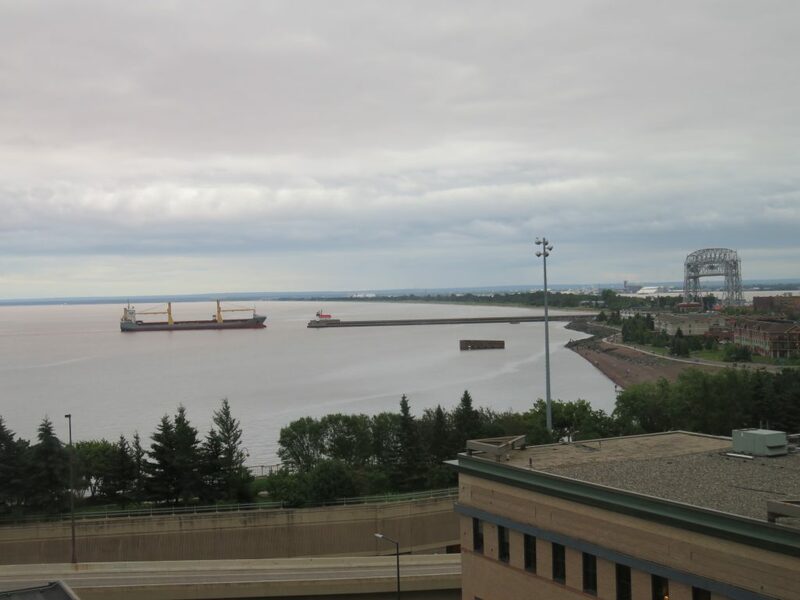 Since we are in the turning basin, it is wide enough for boats to pass her here. Sometimes she comes so close to us we are tempted to say, “Pardon me, would you have any grey poupon?” (Google “Grey Poupon Commercial” to watch on YouTube if you are too young to remember this.) The photo shows a trawler easily able to pass the Jungle Queen. At some parts of the New River, this would be difficult. We always wait to hear where the Jungle Queen is located before we start up the New River. Seas the Day is 25 ft wide so coming around one of the many bends on the river to see the Queen might be hazardous. 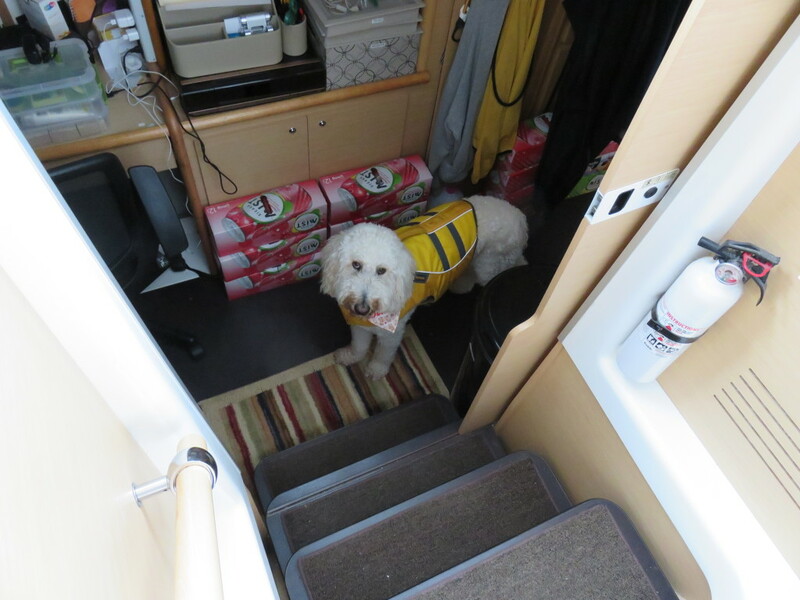 Of course, Sailor was delighted to arrive on the New River. He seemed to remember everything from previous visits. Below are a few pictures of Sailor investigating the area. 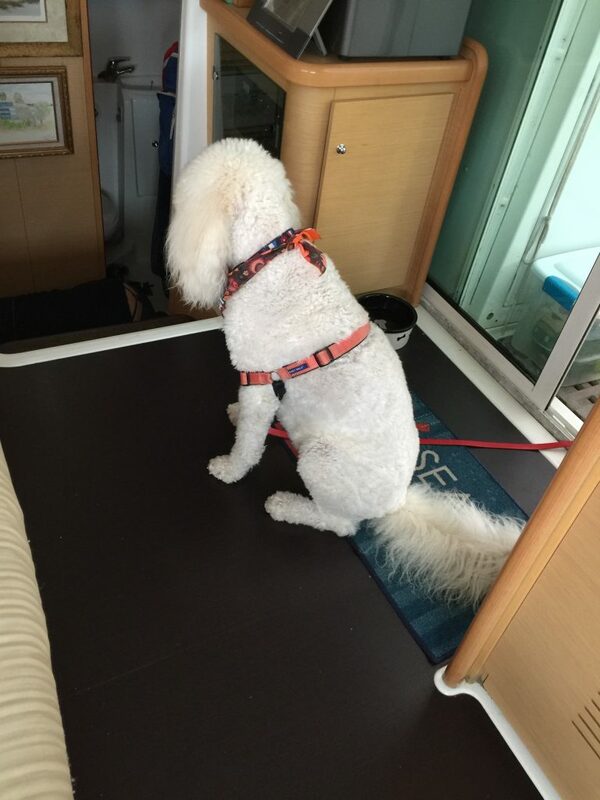 Sailor was very patiently waiting for Mark to finish a boat chore so they could go for their walk. 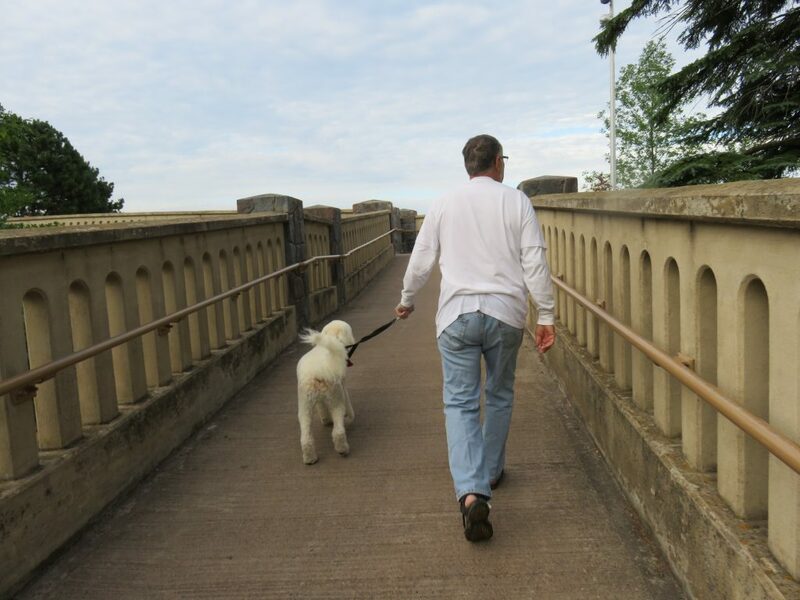 Once they were on their walk, they crossed the bridge and walked on the other side of the river where they found many interesting sights. Below is a sculpture of a sailboat riding a wave with pictures of various local scenes covering the boat. 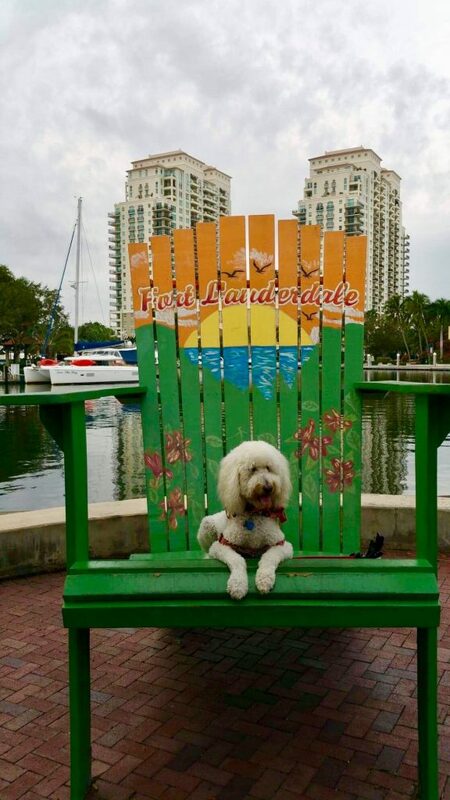 Of course, Sailor insisted on getting his picture taken on a huge chair that he had seen small children climbing on for their photo. 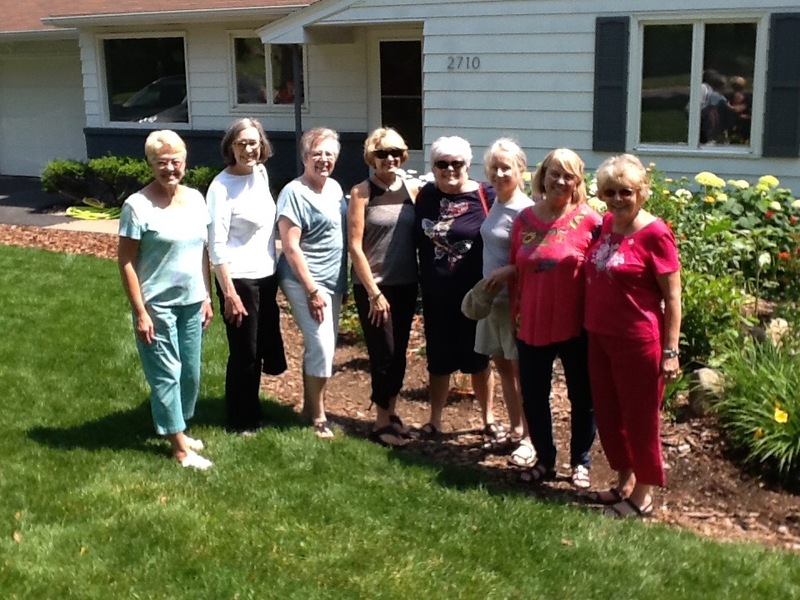 Since Seas the Day was across the river, some of the photos included Sailor’s home. 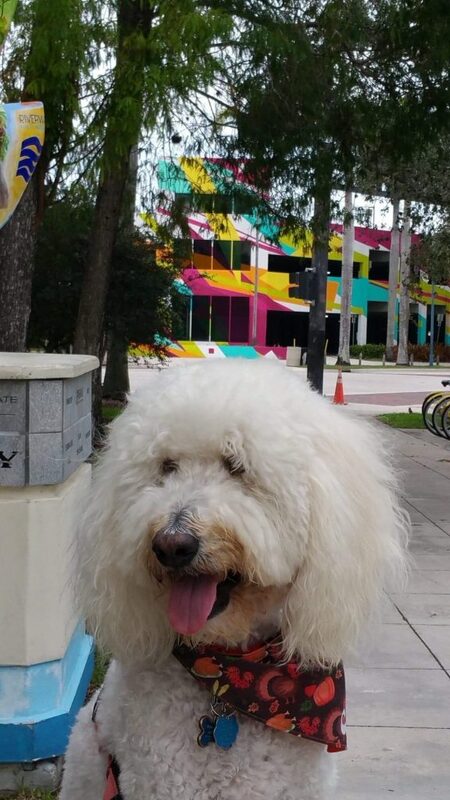 This area of Ft. Lauderdale is very colorful. Walking a few blocks to Publix for a few items yesterday, we had to stop and wait for a train at a crossing. 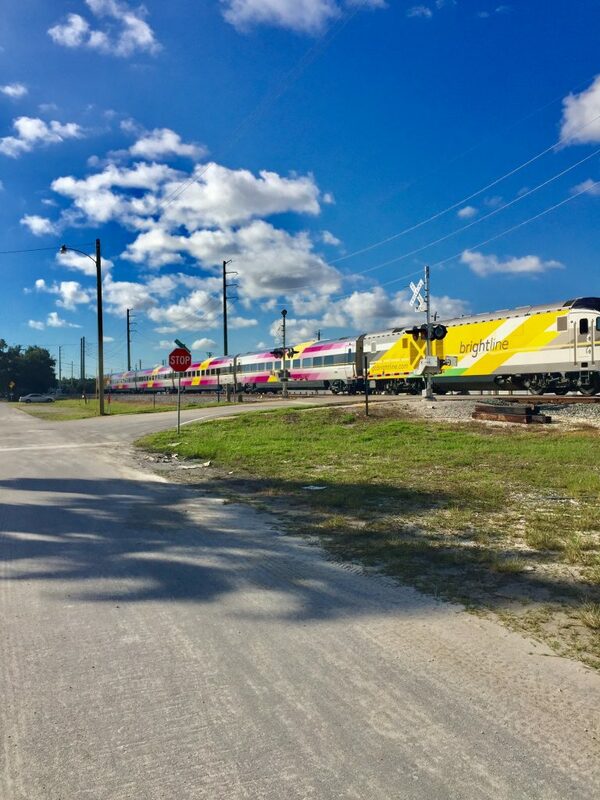 The recently added Brightline passenger trains are what is causing havoc in Ft. Lauderdale, not just the numerous prolonged closings over the river, but also stopping street traffic all over the city. 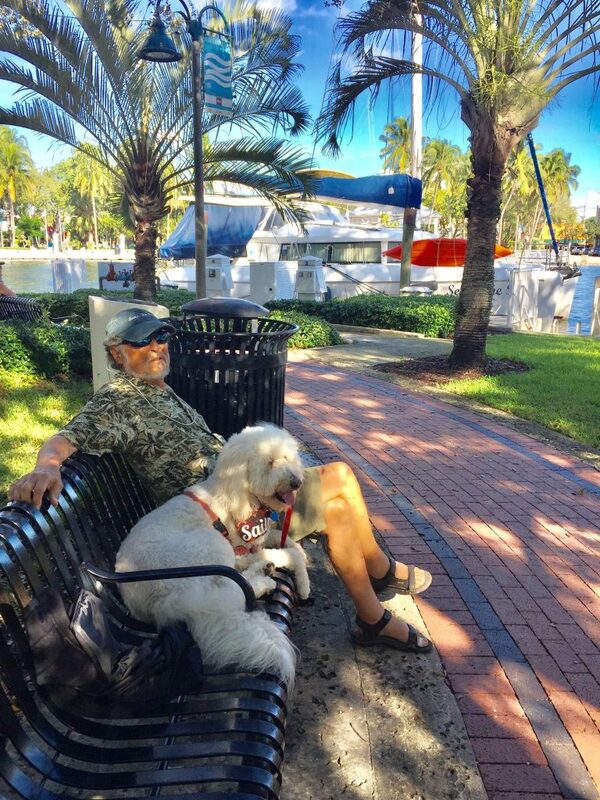 After a long walk, Sailor always insists on resting on a bench. 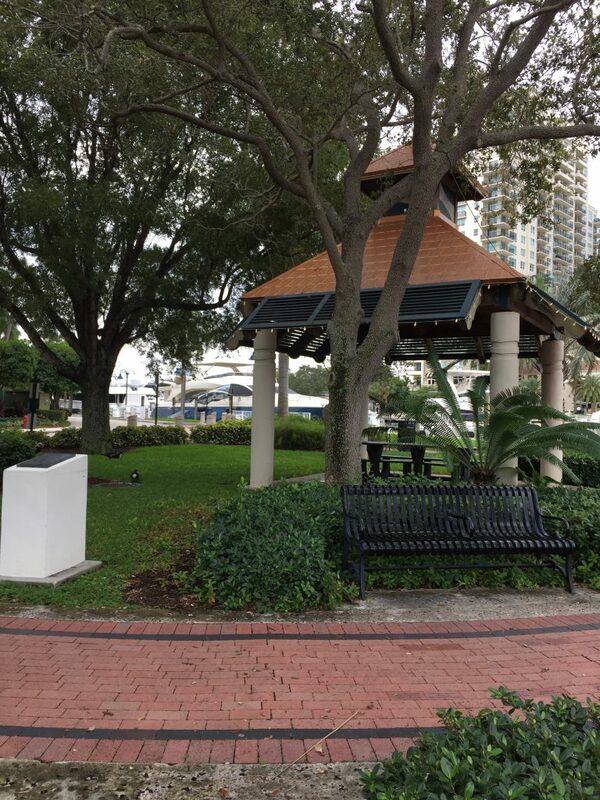 Back home in Stuart, the chosen bench is either in downtown Stuart or in front of Sailor’s Return Restaurant located next to Sunset Bay Marina. 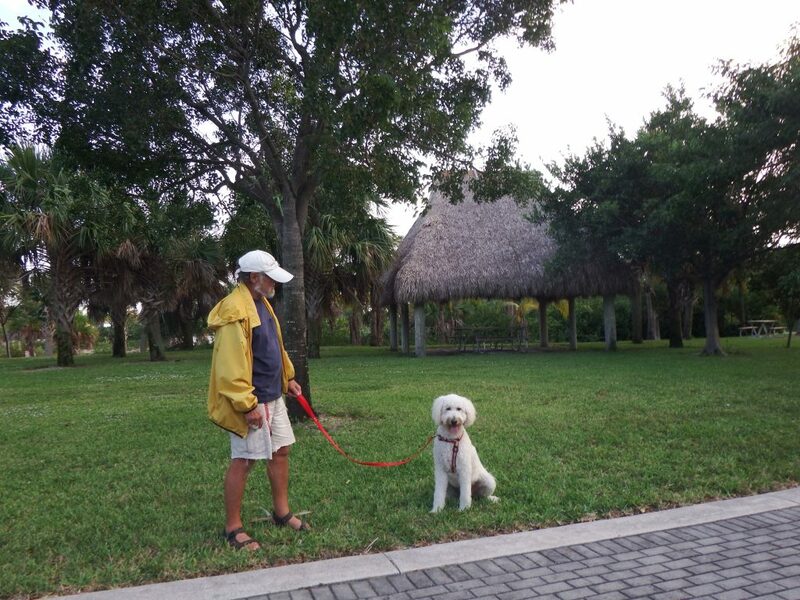 Sailor has many friends in the area of Stuart near our marina, so he is always greeted and pet by many people. 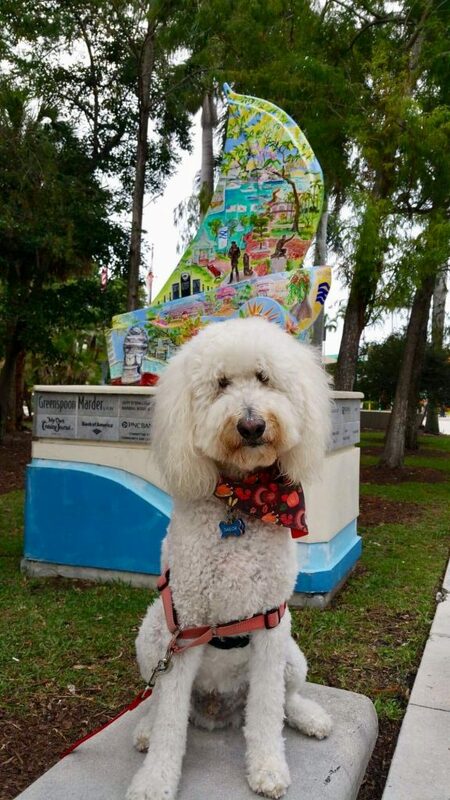 I think he misses the adulation he experiences in Stuart since he was mostly ignored by the people here. 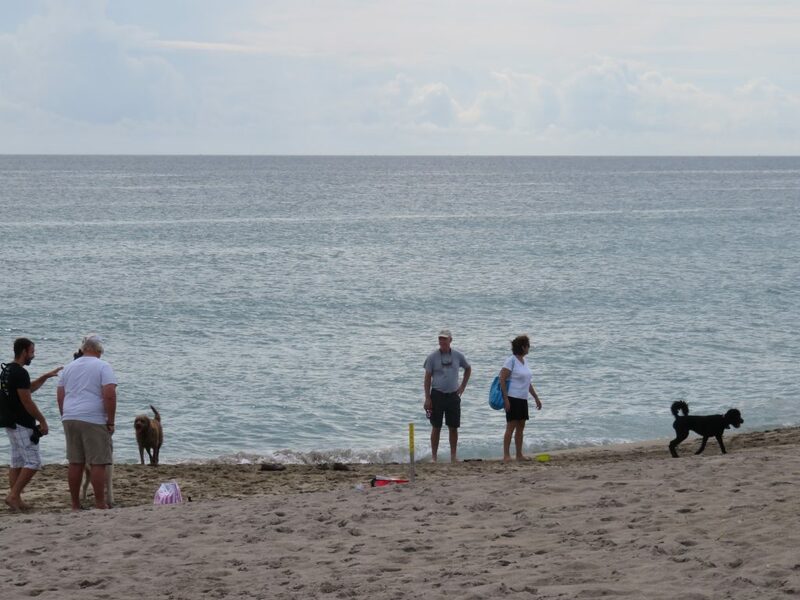 Sadly, every year we stop in Ft. Lauderdale there seems to be more homeless people. They are either sleeping on benches or walking around with large garbage bags holding all of their belongings heaved over their shoulders. The string around Mark’s neck is there to hold onto his hat in case the wind blows it away while we are sailing. I wonder what people who see him think it is. It looks kind of like one of those necklaces that light up in the dark. The string does seem to work since he hasn’t lost his hat yet, so perhaps he should get a patent for it. 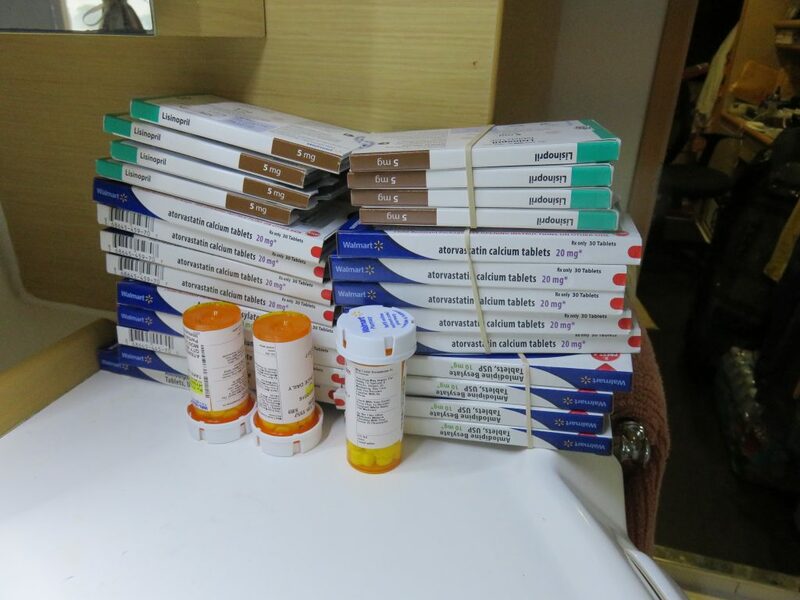 Incidentally, the numerous bruises on Mark’s arms are due to blood thinning drugs, but seem to have gotten worse due to the hormone treatment he has been taking for his prostate cancer. 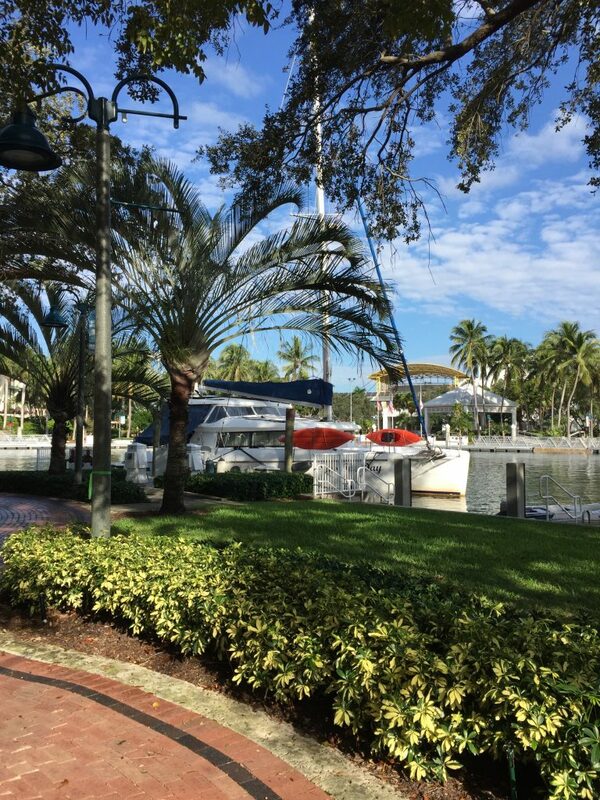 We are staying in Ft. Lauderdale until Sunday and then will sail to Miami. We missed the latest weather window to sail from Miami to Bimini on Saturday and Sunday. The next chance as of now is at the beginning of December. 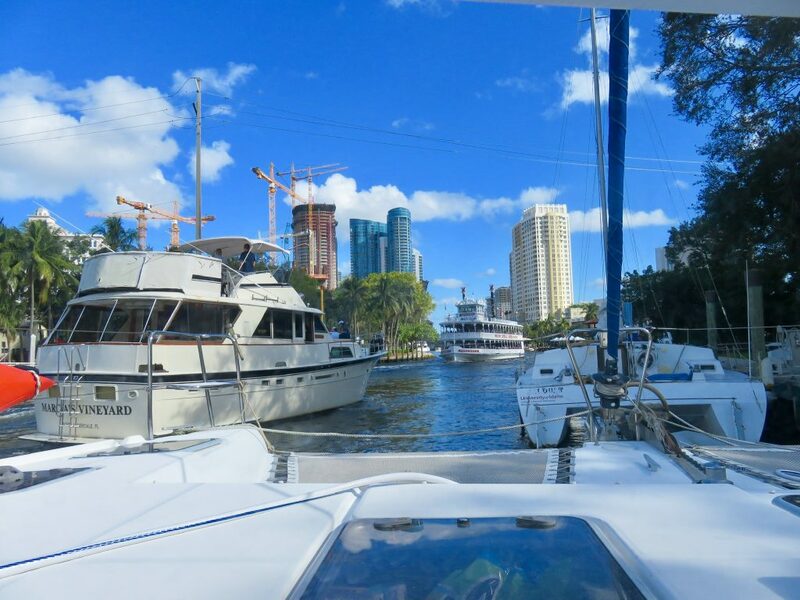 We’ll spend the waiting time on a mooring ball at Dinner Key in Coconut Grove, part of the Miami area. 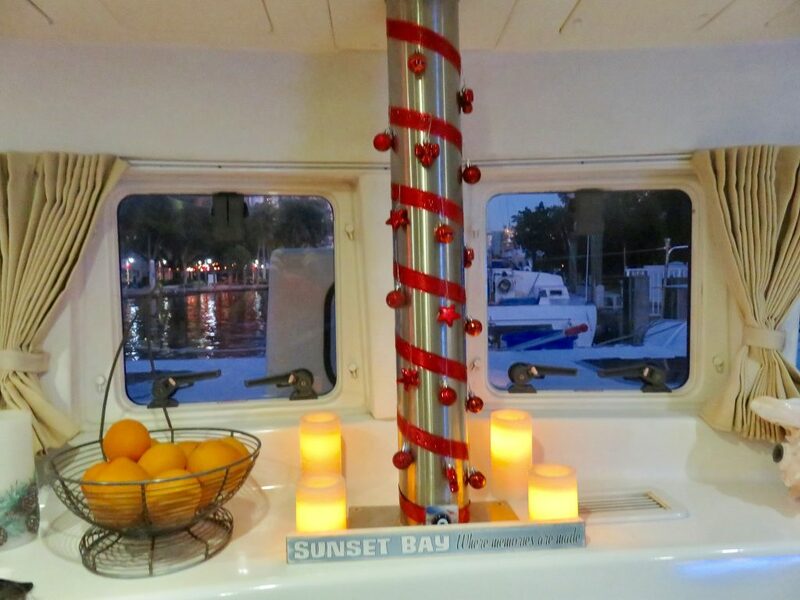 Finally, one nice thing about being on shore power is that we were able to decorate our boat for Christmas and actually turn the tree lights on! 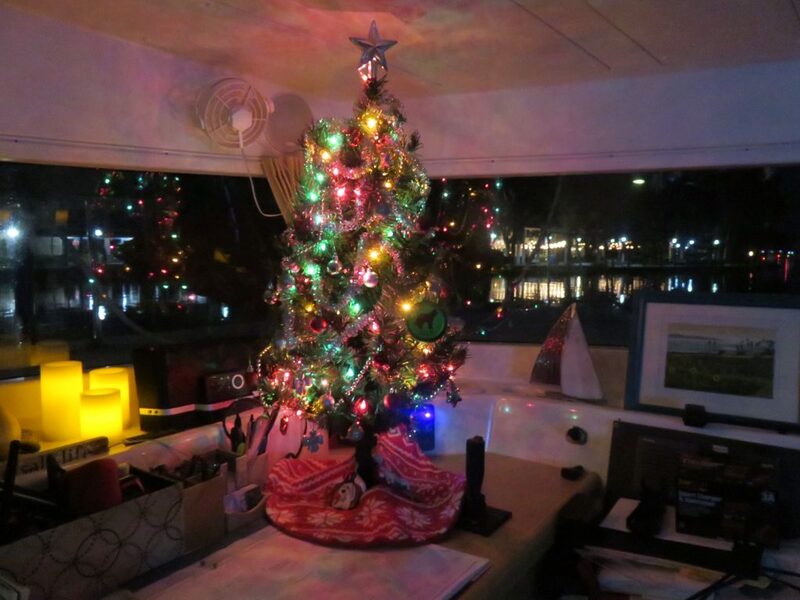 We purchased our three foot Christmas tree with attached lights ten years ago for our first Christmas on the boat. 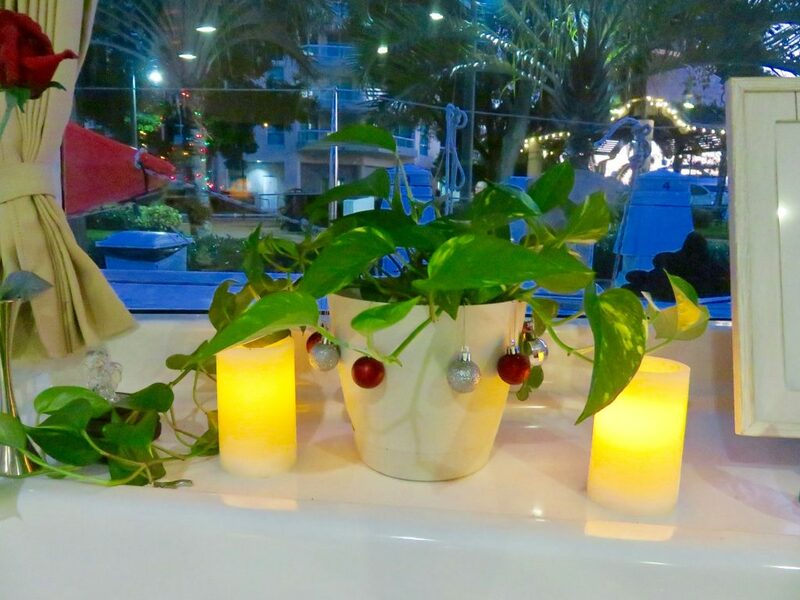 The pothos plant in the decorated pot is very special to us. Pothos grow wild in fields in Spanish Wells. Several years ago we took a small cutting to remind us of one of our favorite stops in the Bahamas, our last one each trip. 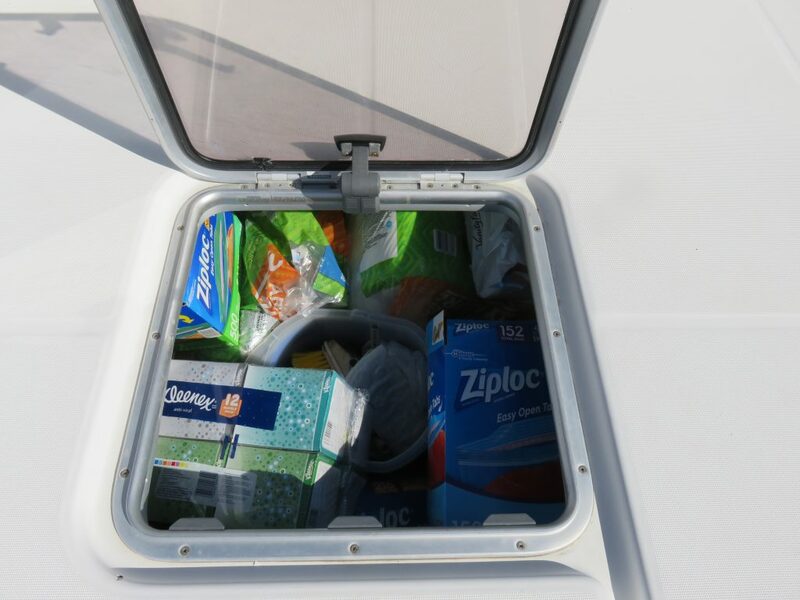 This entry was posted in Sailing and tagged Boat Repairs, Ft. Lauderdale, Sailor on November 24, 2018 by Jan.
After weeks of preparations, and a summer and fall of repairs and new purchases for the boat, this past week we had a weather window to get to Miami. 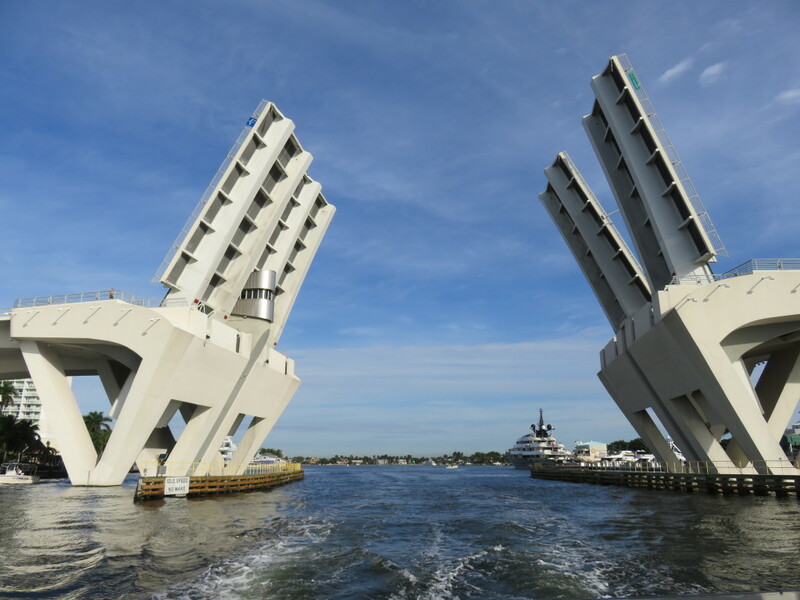 Our wonderful dockmates helped us release the lines on Wednesday, November 9, and we were on our way…….until we reached the 65 ft Roosevelt Bridge next to our marina. The tide had been higher than normal, so we waited until mid tide and still barely made it under the bridge. 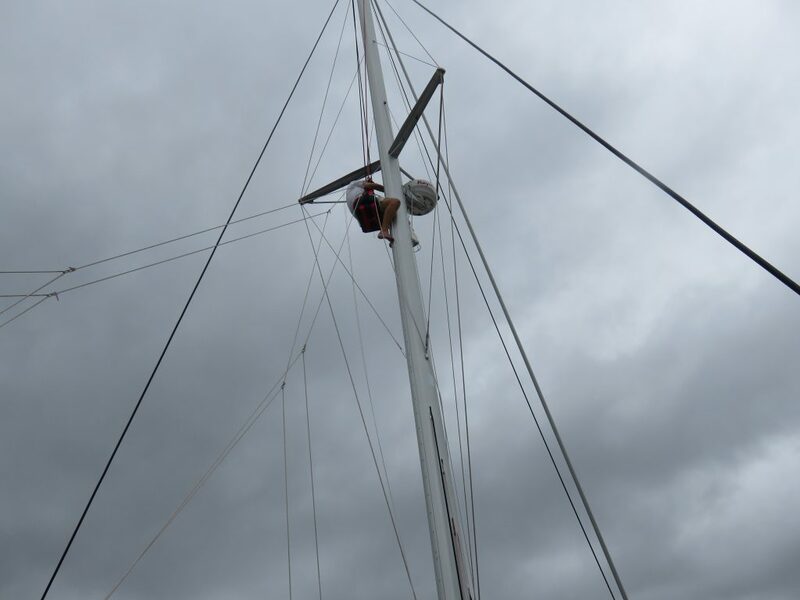 Our mast is 63 ft (cut down from 68 ft so we could go under the ICW bridges) and the clearance sign said 64 ft, however we have instruments on top of the mast so we knew it would be close. For the first time our antenna dragged across the underside of a 65 ft bridge. After that we had an uneventful motor to Lake Worth. We rarely had to slow down for bridge openings. Some are on the hour and half hour and others are on demand, but we seemed to time it perfectly. 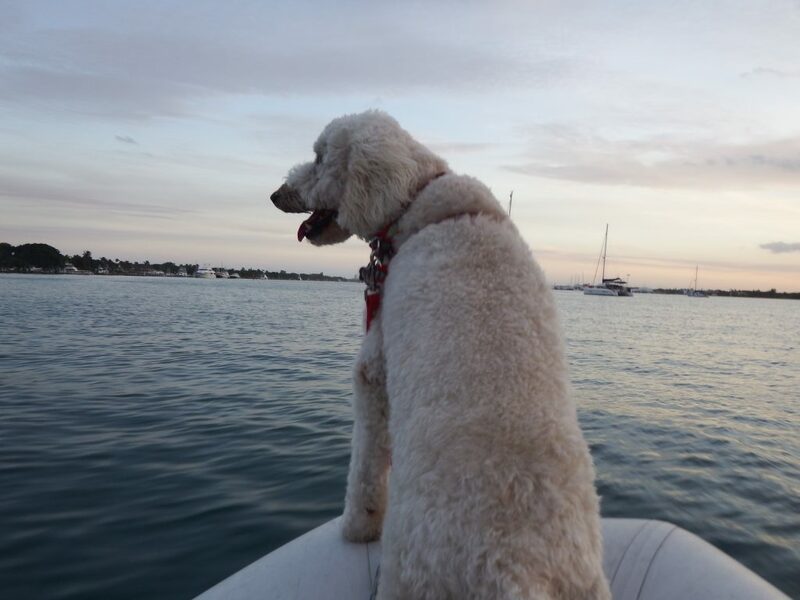 We anchored near the Lake Worth Inlet and took Sailor for his first dinghy ride of the season over to Peanut Island. The next morning we left the Lake Worth Inlet and turned south towards Ft. Lauderdale. The seas were calmer than predicted, in fact there weren’t even white caps. 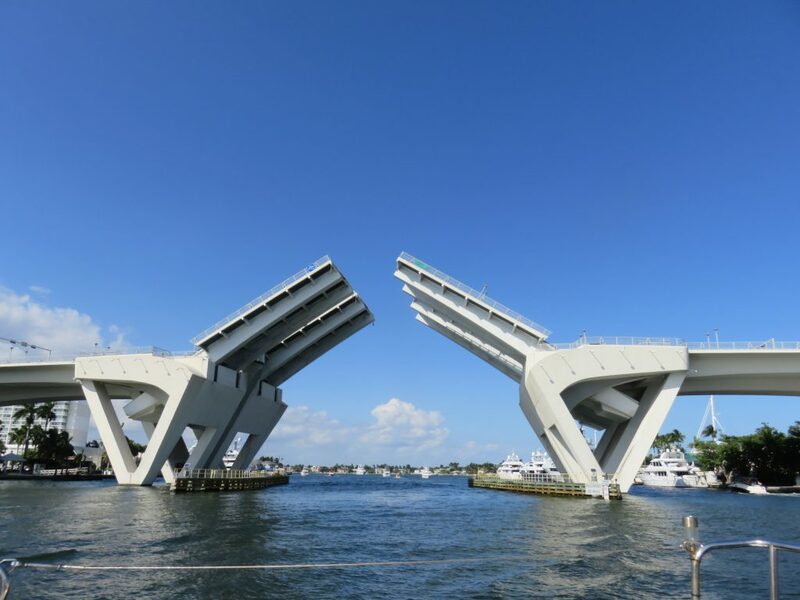 We made good time and went under the 2:00 opening of the 17th St Causeway Bridge. This was the roughest part of the cruise so far with a number of powerboats racing by us in the inlet. 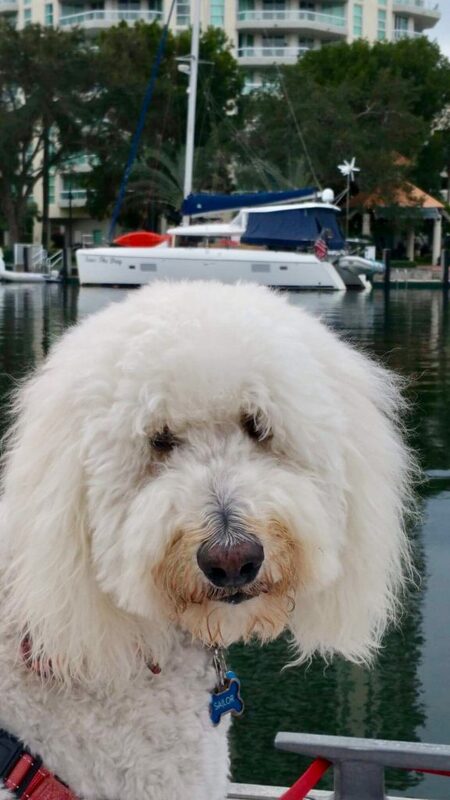 We have stayed at the New River City Marina many times and they know us so the dockmaster gave us a slip before the first bridge. There are numerous bridges on the New River and they are closed between 7:30 am and 9 am on weekdays, therefore we would need to leave before 7:30 or after 9 am to get under the bridges and to the inlet. 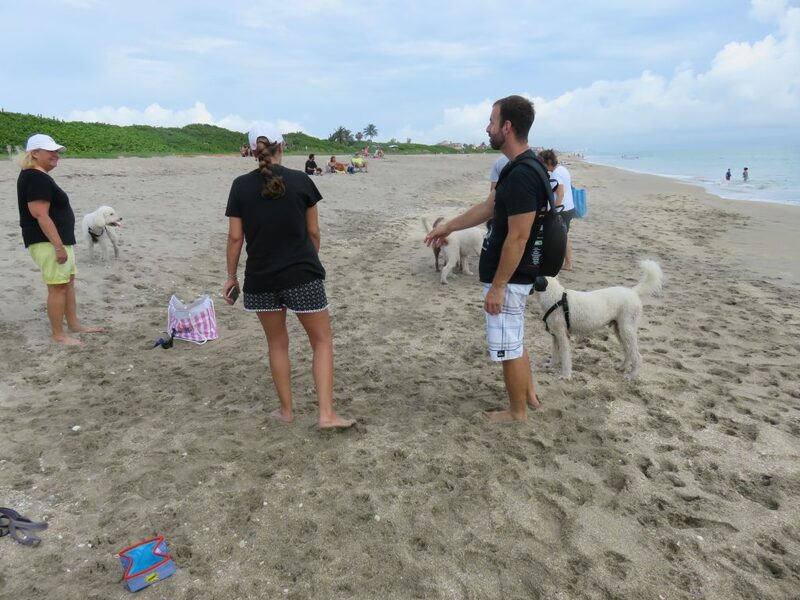 We had two surprises on our way out to the ocean. First, turning towards the bridge from the New River, we suddenly ran over something and heard it banging under our port hull. Assuming is was a log or some other debris, Mark backed up but we couldn’t seem to lose it. Then a fire boat came by and they told us we had run over a buoy. Oops!! It was small, close to the water level and Mark didn’t notice it. I was inside at the time. Backing up further, the buoy popped up and we continued on to the bridge. 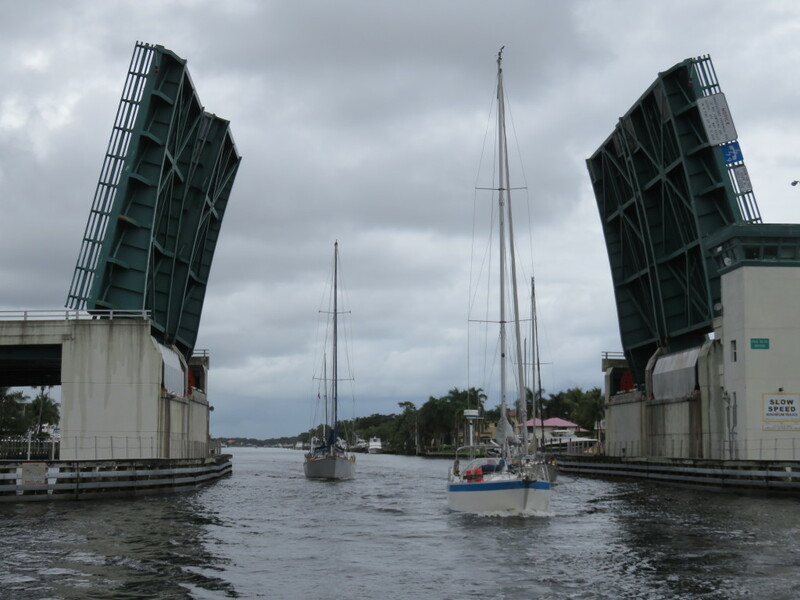 At the 9:00 opening of the 17th St Causeway Bridge, we went under and turned into the Port Everglades Inlet. Oops again. A cruise ship was returning to her slip by the bridge and was taking up most of the channel. We had to turn around and pull over so she could get by us. Then we entered the inlet and for once no powerboats raced by to wake us. We turned south towards Miami and had a pleasant smooth motorsail again. Coming into the Miami Inlet is much easier than Port Everglades in Ft. Lauderdale. That is probably because Miami is a busy commercial harbor and numerous cruise ships are close by. 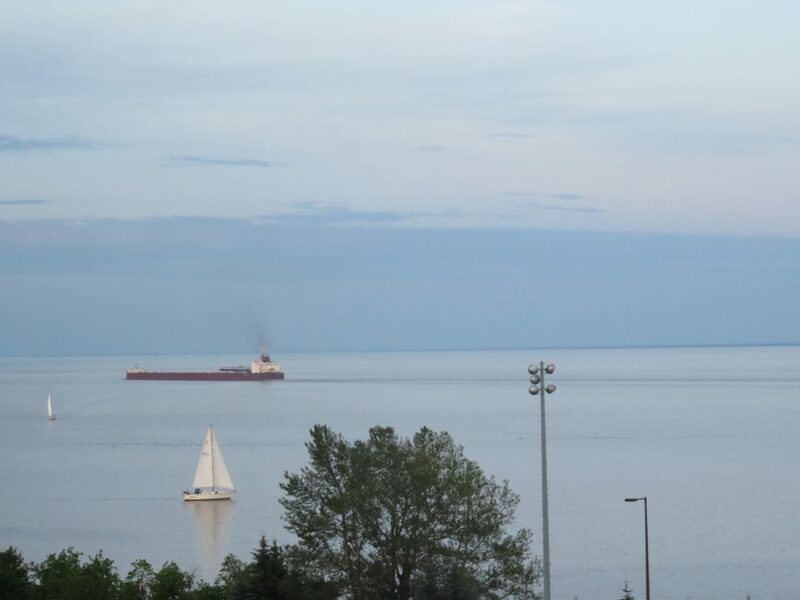 We rarely see any boats speeding into the harbor. 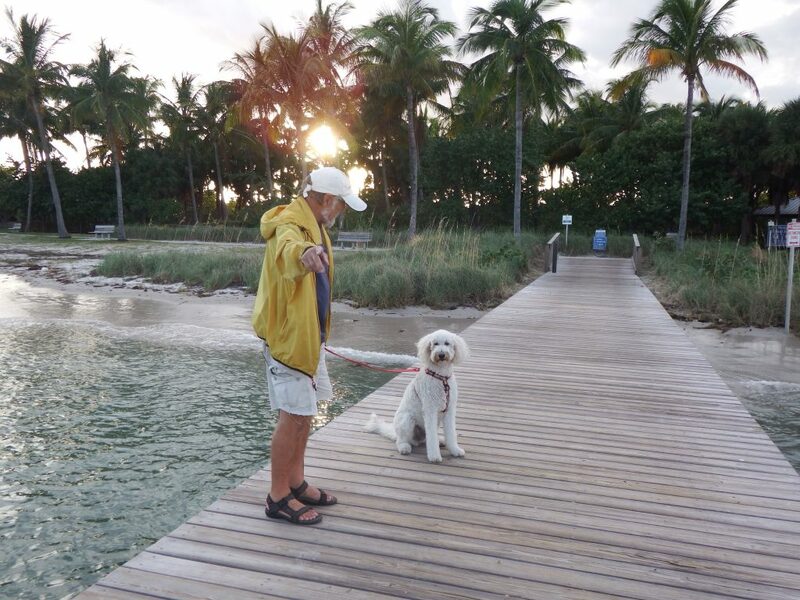 Our first stop after going under the Rickenbacker Causeway into Biscayne Bay was at Crandon Park Marina to get fuel. The older gentleman who has always been there in past years wasn’t working and the young man taking his place didn’t seem too enthusiastic. We had to call the marina to get him to come outside and catch our lines. While Mark was filling four jerry jugs with diesel after filling both tanks, the young man told us he was going back inside to eat his lunch and we could call when we were finished. When I went to the office to pay the bill, I handed him a tip and suddenly he seemed more interested in helping us with the lines as we left. As we approached the Dinner Key Mooring Field in Biscayne Bay, we called and got a ball assignment. They said to grab ball 170 and gave us directions to where it was. We went up and down the rows and there was no ball 170, so we called the office and the worker again gave us directions. After looking for 15 minutes we called again and this time someone from the mooring field was there and told us that ball had been “deactivated” and assigned us another one. 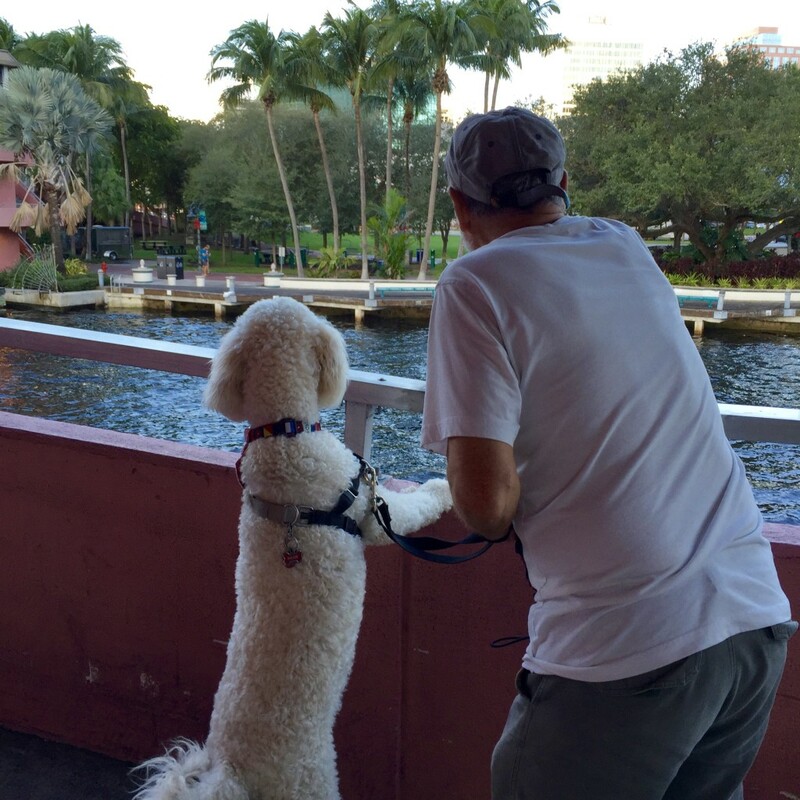 We have spent three days here, walking around Coconut Grove and visiting the dog park, which is very nice. There is astroturf and recycled tires are used for the paths. 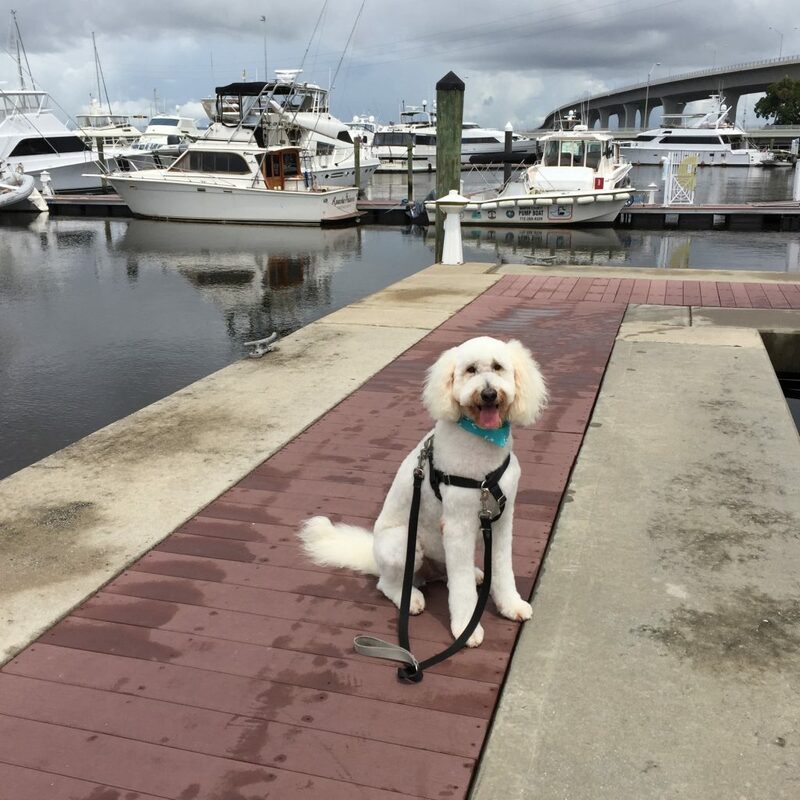 Sailor has gotten a lot of exercise each day and should be ready now for beach runs. Today my son Peter arrived and he’ll be joining us as we make our way through the Bahamas to Georgetown. I enjoyed my last frappuccino at Starbucks until we return to Florida at the end of May. Well maybe I’ll have one in Nassau. 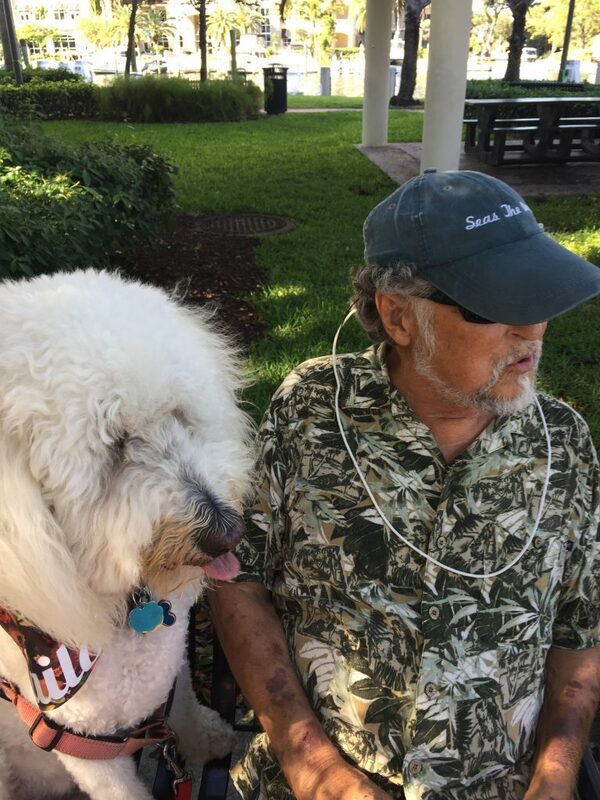 We made final visits to the local grocery stores, Milam’s Market and Fresh Market, mostly for fresh fruits and vegetables plus a few items we forgot to purchase during our provisioning shopping trips in Stuart. 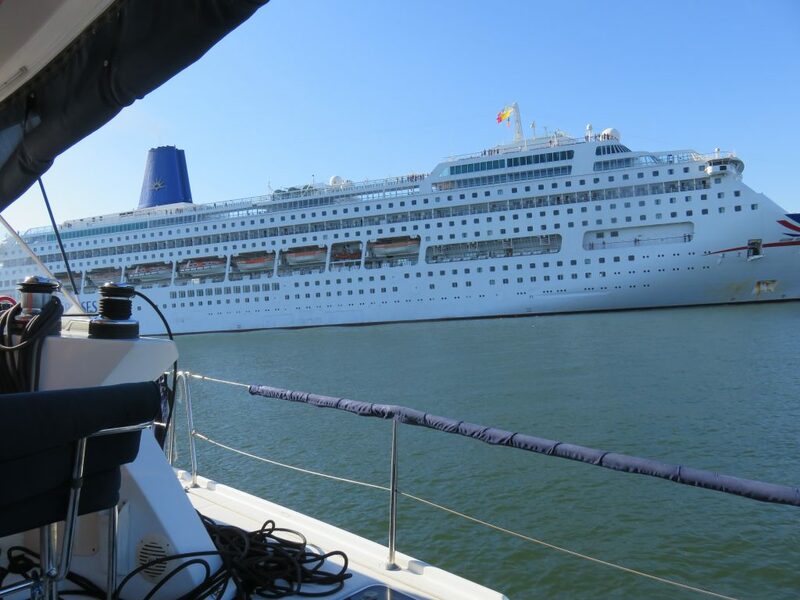 The forecast for the crossing on Monday is 1-3 ft seas and light and variable wind. If that turns out to be correct, we will have a pleasant motorsail to Bimini. There has been almost a week of mild weather but of course it can’t continue. A front will be passing through Florida and the Bahamas In a few days. 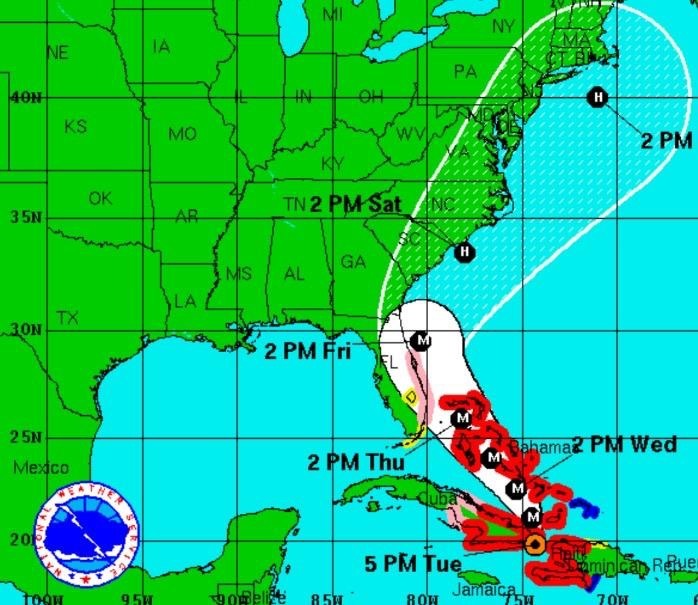 We will not be able to make it all the way to the Exumas without an extended stay somewhere. If we have two more good days we’ll get to Nassau. Otherwise we’ll stay in Bimini rather than going on to Chub Cay or Frazier’s Hog Cay in the Berries where there is nothing to do on shore. In fact, Chub Cay is a private island and we can’t even take Sailor to the beaches. To further complicate our cruise to the Bahamas, we have been getting email updates on a Tropical LO forming in the Caribbean. This could possibly develop into a hurricane over the next few weeks. 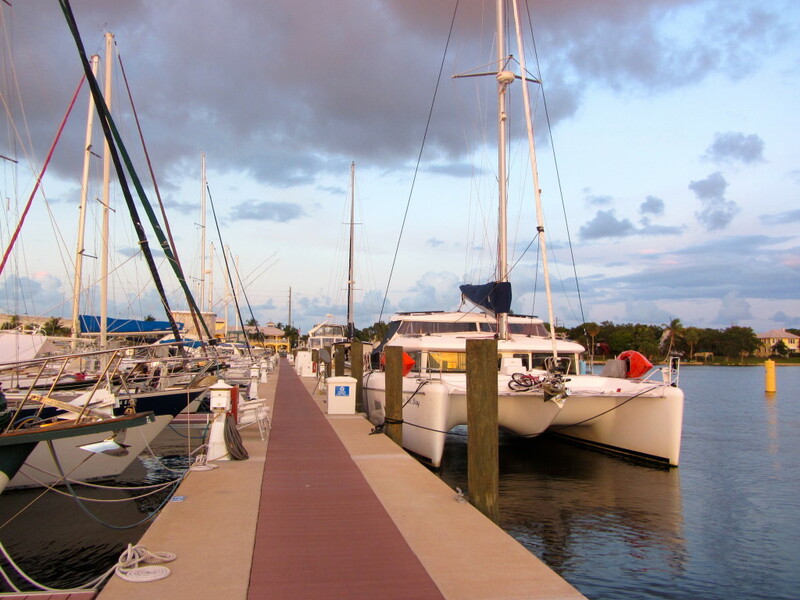 Hurricane season isn’t finished until the end of November, but since they are rare in November, our insurance policy allows us to leave our marina in Stuart after November 1. We will watch this system closely and make sure we are in a safe place if it becomes a hurricane in the Bahamas. 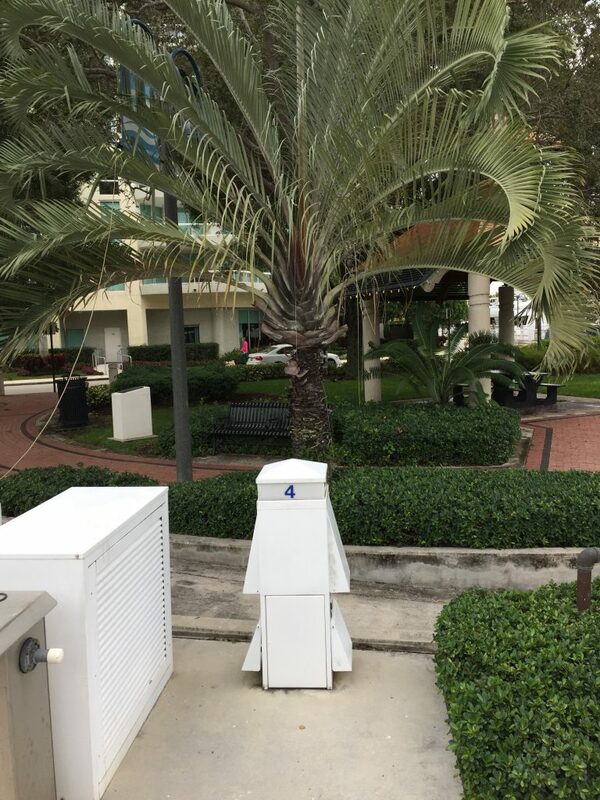 This entry was posted in 2016-2017 Bahamas Cruise, Florida, ICW and tagged Ft. Lauderdale, Lake Worth, Miami on November 13, 2016 by Jan.
After a few delays for weather we finally left Sunset Bay Marina on Tuesday, December 8, 2015. 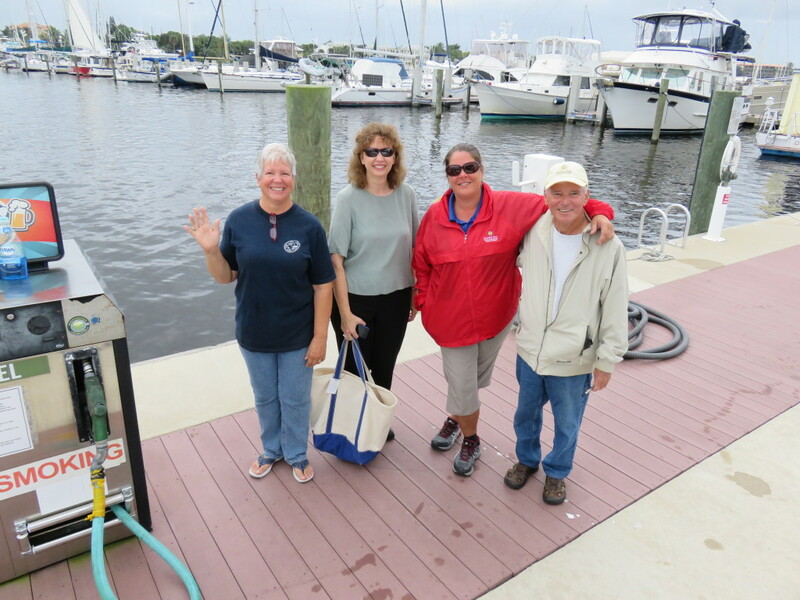 We had a great group helping us get off the dock and as much as we want to get to the Bahamas we will miss our friends in Stuart. We were worried about getting under the 65 ft. Roosevelt Bridge as we exited Sunset Bay because due to all the rain, tides are extremely high. 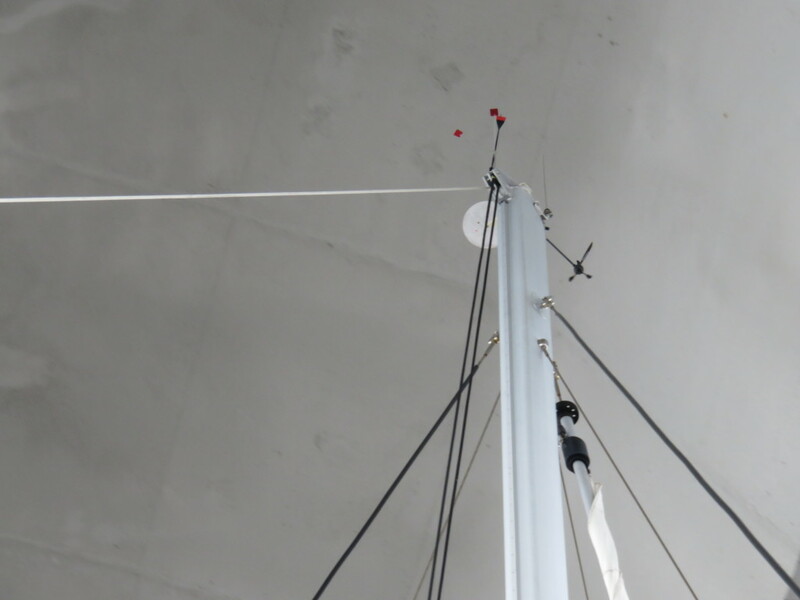 Our mast is 63 ft plus the instruments at the top and we did get under without touching. The next day we weren’t so fortunate. 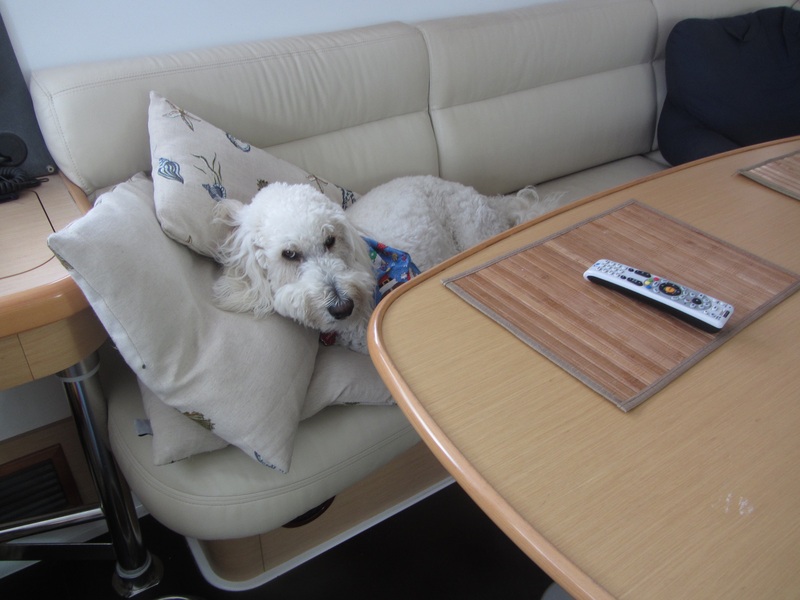 We had a pleasant motor on the ICW to North Palm Beach and stayed at the North Palm Beach Marina. As usual lately, it rained part of the day. Still this was the best weather in awhile and there was a train of boats traveling down the ICW. 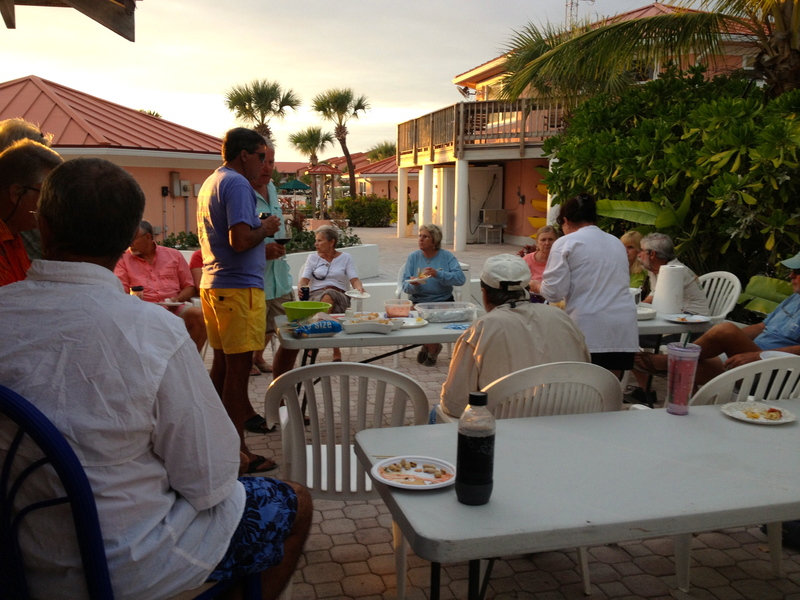 We were in a group of eight each time we waited for a bridge opening but after we arrived in North Palm Beach we watched many more boats passing by to get into marinas or anchorages in the area and no doubt continue south the next day or perhaps head east to the Abaco Islands. 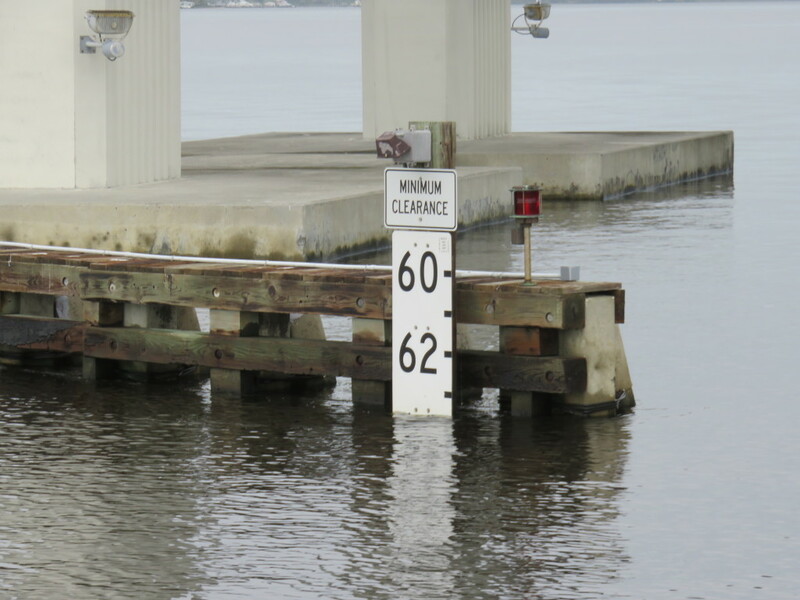 The next morning, an hour after high tide, we approached the Riviera Beach Bridge and saw the board showed 62 1/2 ft clearance. 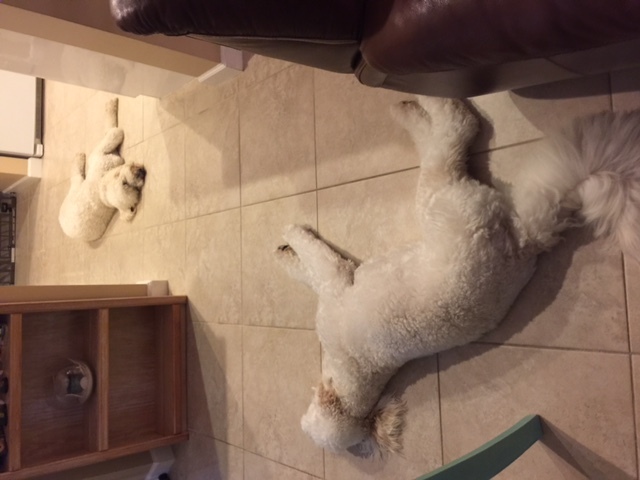 We decided to wait as we watched the board. An hour and a half later the clearance was just a little over 63 ft and we decided to go……very slowly. As we started under the bridge our antenna started to drag on the bridge bottom. It has never done that before, but we continued and made it under with the antenna dragging the whole way. No pictures here as we were both watching the mast very closely. 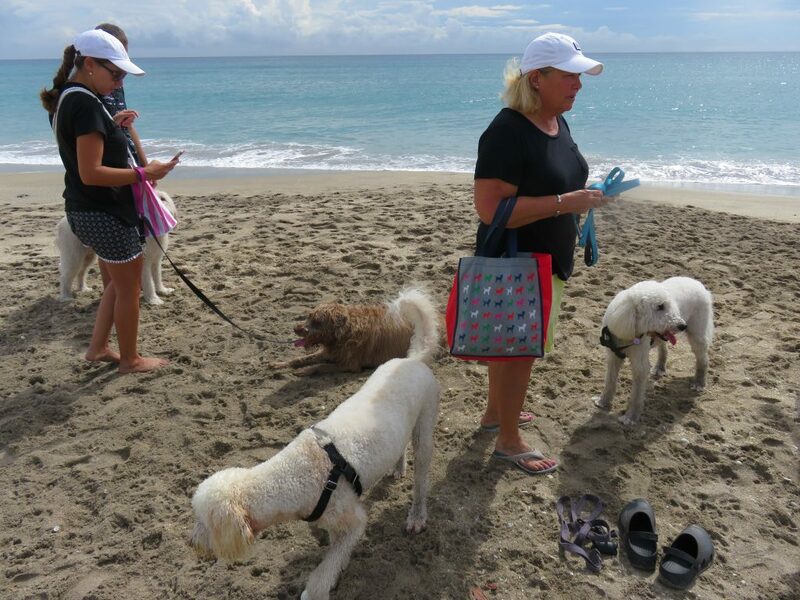 We exited the Lake Worth Inlet to the ocean and turned south to Ft. Lauderdale. Even though there weren’t even white caps, the seas were rough and confused (coming from all directions). 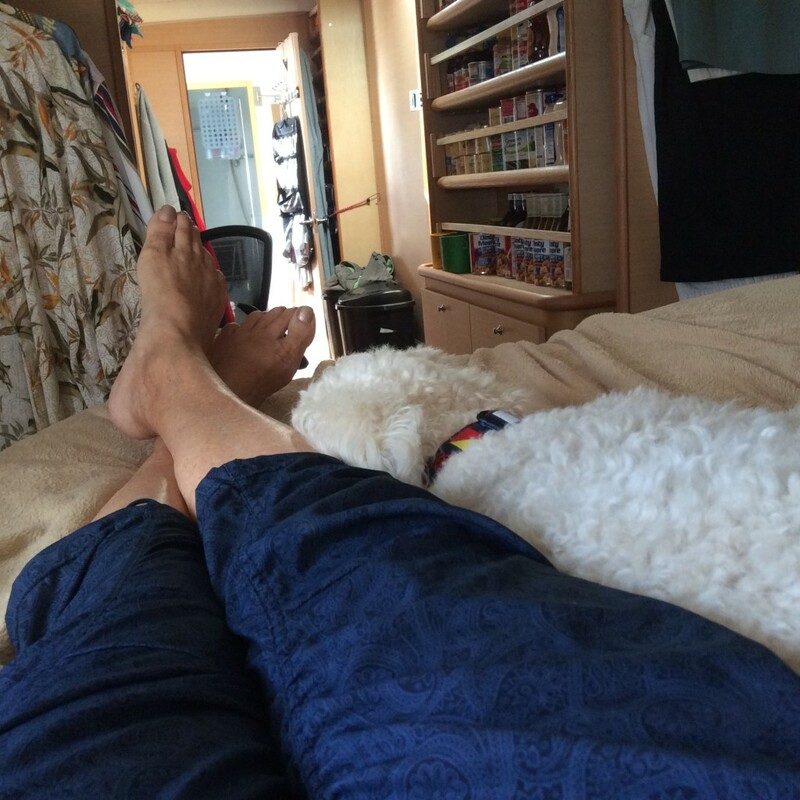 Sailor is a fair weather sailor and always lets me know he wants to get into the bed by going down the steps to the companionway and staring at me until I come. 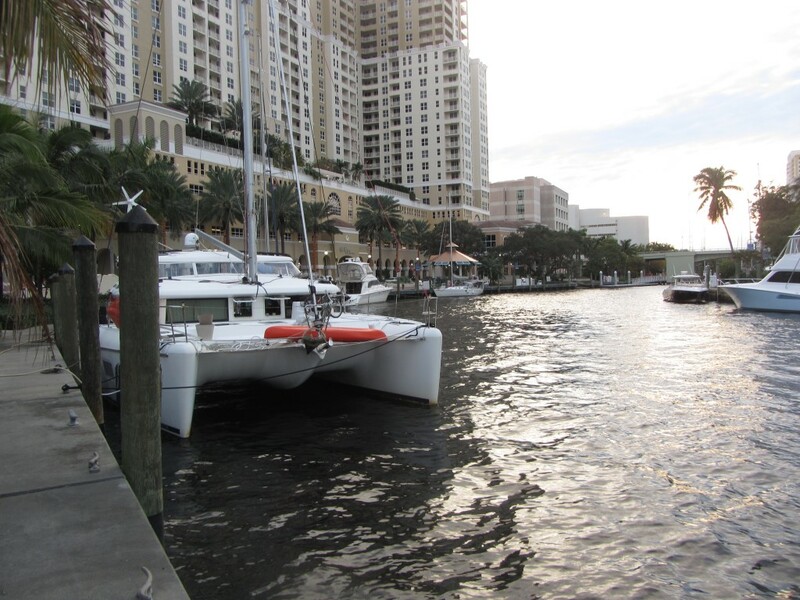 We were very happy to arrive in Ft. Lauderdale and motor up the New River to tie up at the New River City Marina along the Riverwalk. We walked across the bridge and had dinner at Briney’s Irish Pub and got a good night’s sleep. 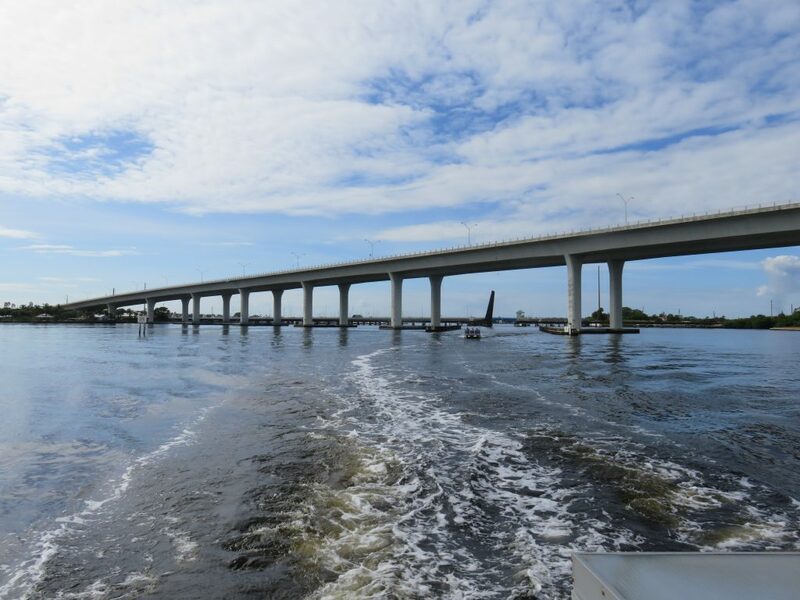 Thursday we left under the 17th Street Causeway bridge opening and again turned south to Miami. 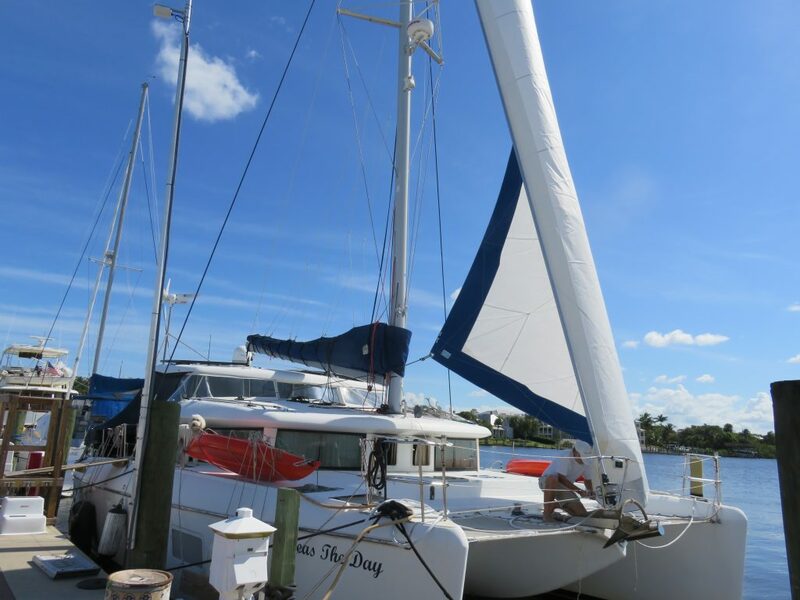 This was a pleasant, calm motorsail and we arrived on ball 157 at Dinner Key Mooring Field after filling up with fuel at Crandon Park Marina for the trip to the Bahamas. As mentioned in the previous post, cruising plans are written in sand. The next good weather window to go to Bimini is next week and that’s when we hoped to cross. That was the plan. However, Mark had to work on the dinghy motor because when he moved it to the new dinghy before we left Stuart it tipped and oil got in it. Despite his best efforts to repair it, the motor is dead and we have to buy a new one. Mark was able to find exactly what we wanted in the Miami area, but it has to be ordered and won’t get here until next Wednesday or Thursday. The good news is we found out before we left, although we could have purchased a good outboard motor in Nassau. Also, this is a nice place to stay. 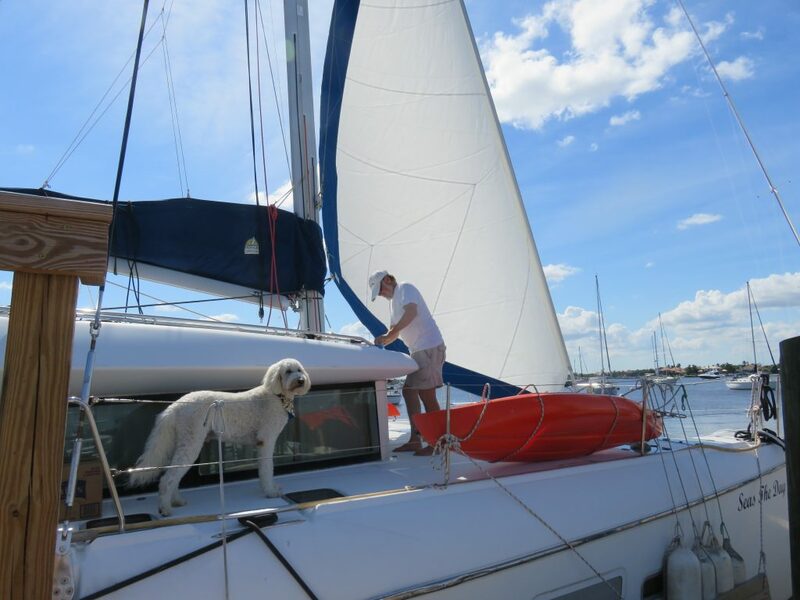 One year we spent most of the winter on a mooring ball at Dinner Key when we were waiting for the boat to be converted to twin diesels from an electric hybrid system. 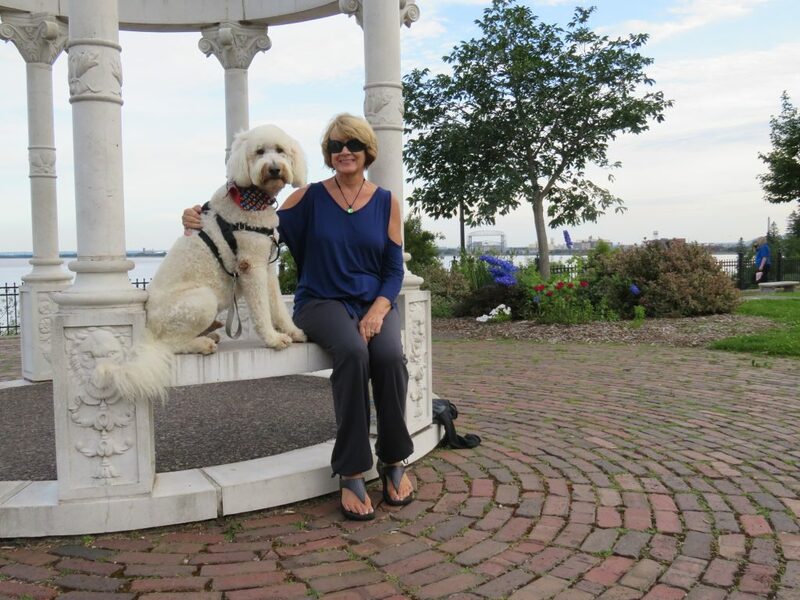 There is a Fresh Market a few blocks away, lots of great restaurants, the best dog park we’ve ever seen nearby, and the marina has been updated with a new three story building and all new facilities inside. Also, there is a water taxi shuttle that comes to pick us up and drop us off from 0800 to 1700 so we don’t need our dinghy while we are here unless we want to be off the boat after 5 pm. This is good for us because until next Thursday we can’t use our dinghy. We could row in but being on Biscayne Bay, the waters are rarely calm and there is almost always a brisk wind. The shopping and eating area of The Grove has many choices. We headed straight for this one. 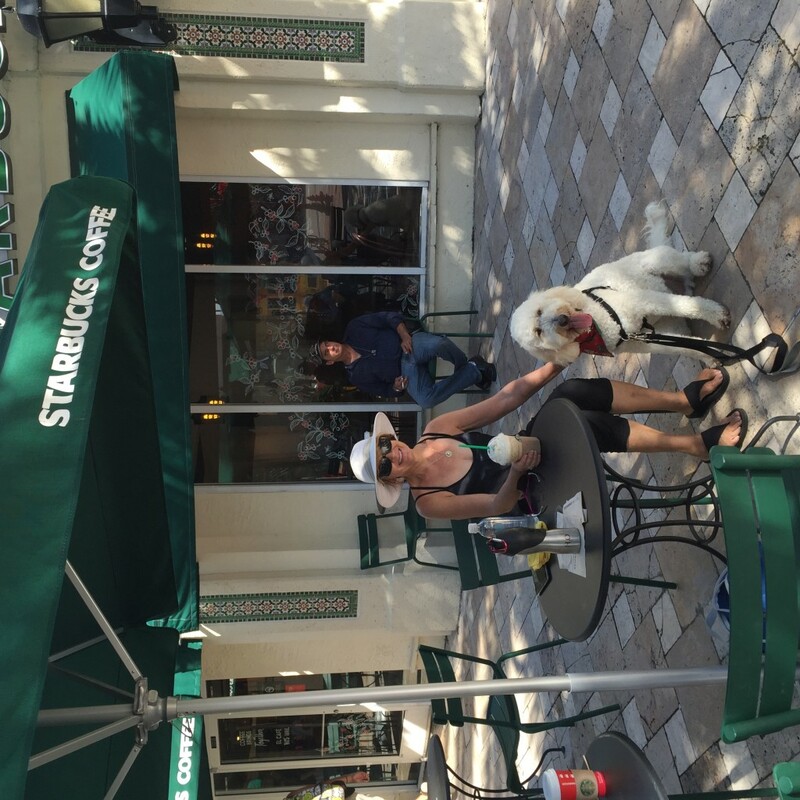 Once we are in the Bahamas, Nassau is our last chance to go to a Starbucks. 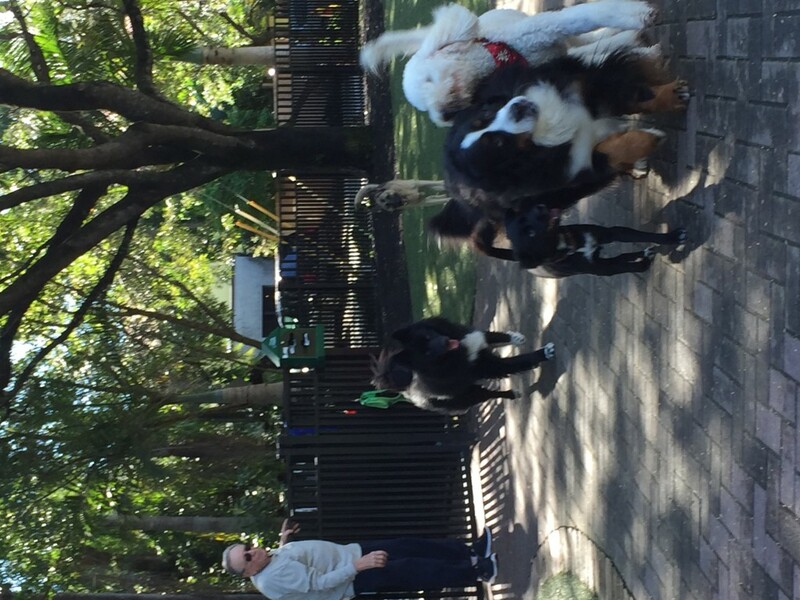 Below is a photo of Blanche Dog Park in Coconut Grove, a six block walk for us. 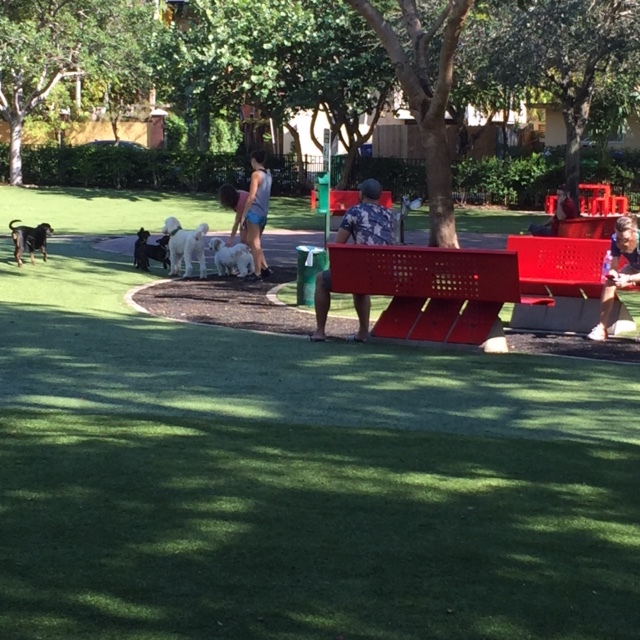 The astroturf and recycled tire walkways make this the perfect dog park because even though it rained the morning this picture was taken, no dogs got muddy! Chris Parker, the marine weatherman whose forecasts we subscribe to, says next Tuesday and possibly Wednesday are good days to cross to the Bahamas and there might be one more opportunity before Christmas on December 24. I suspect we’ll be celebrating Christmas in Miami. Nothing new here. No matter how early we start, we have never made it to the Bahamas before New Years’ Eve. 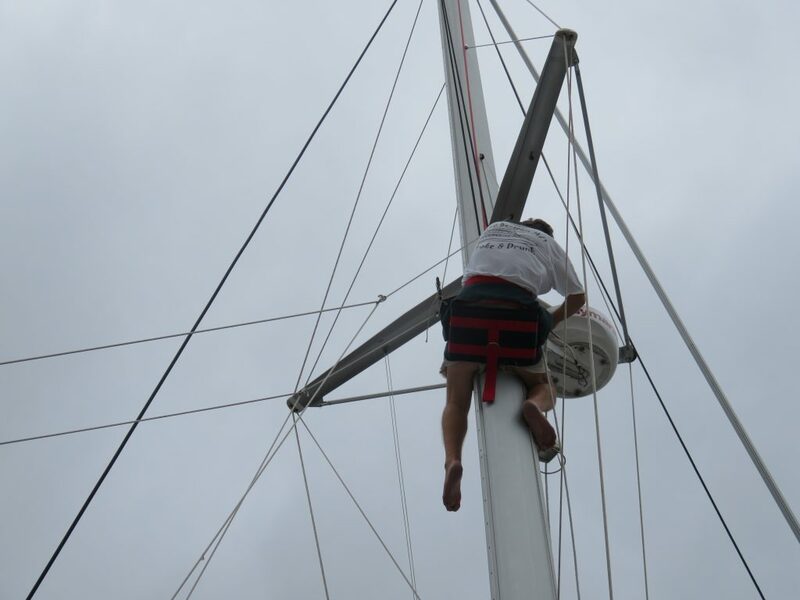 Weather and boat repairs always hamper our plans. 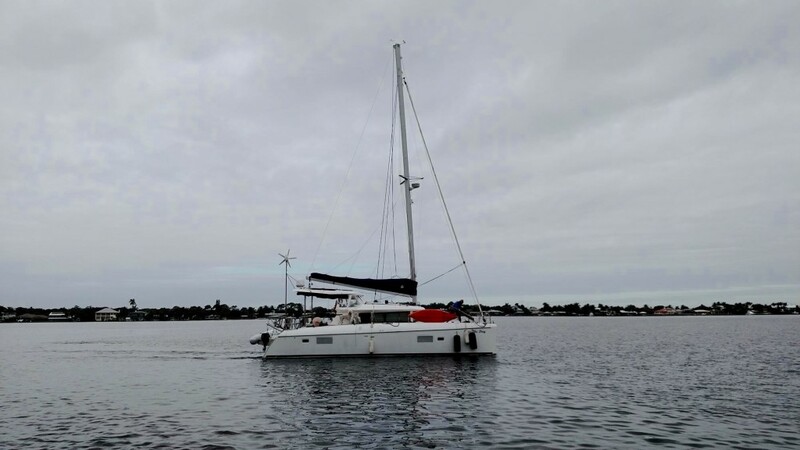 One year we were almost to Bimini and our previous hybrid propulsion system failed. We had to be towed back to Ft. Lauderdale and we made a successful run to Bimini a few weeks later. We’ve talked to a number of other cruisers who are here at Dinner Key waiting to go someplace. Almost every person has either said they aren’t quite sure where they are going or not quite sure when. 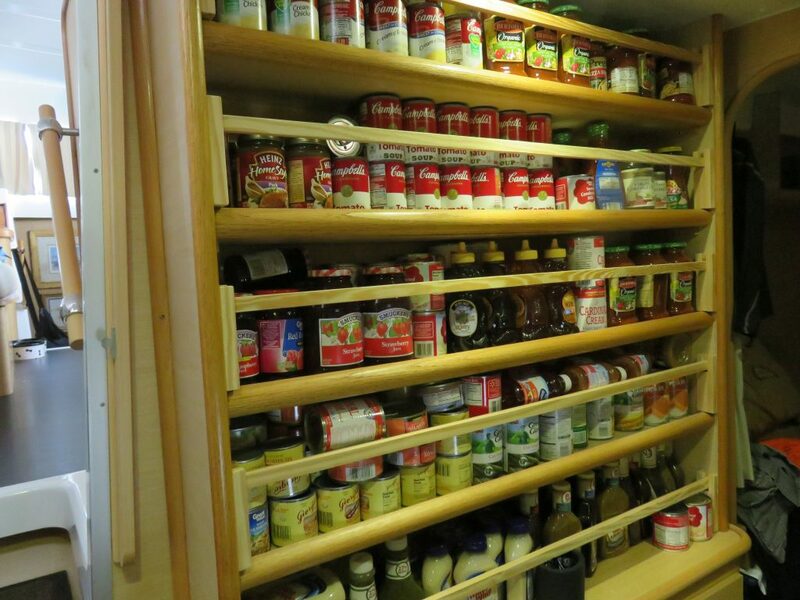 We know there are many people who would like to have this “problem” and we realize how blessed we are. 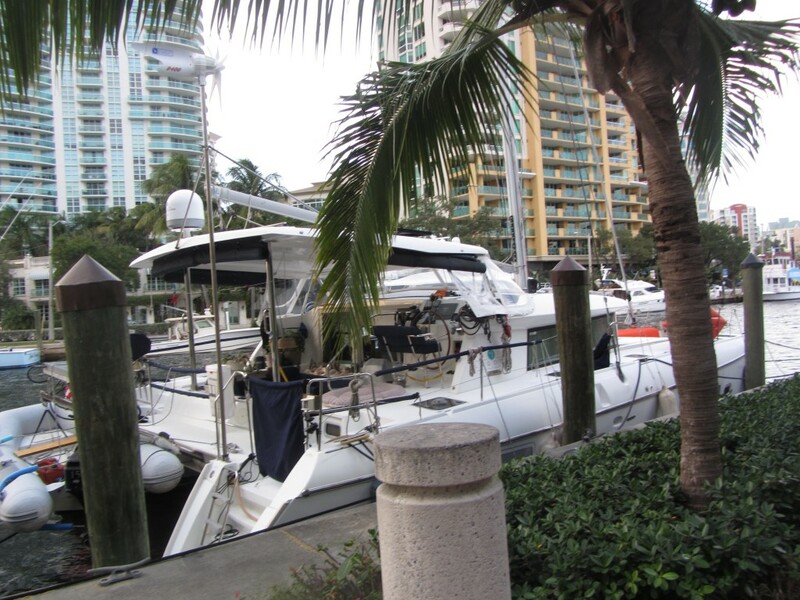 This entry was posted in 2015-2016 Bahamas Cruise, Florida, Sailing and tagged Boat Repairs, Ft. Lauderdale, Lake Worth, Miami, Sunset Bay Marina on December 12, 2015 by Jan.